I’ve been fortunate to do some pretty amazing travel in the past, but the journey I just returned from has certainly stolen the show. As an evolution nerd, a Darwin enthusiast, and a lover of the natural world, a trip to the Galapagos was truly an experience I will never forget. I’ve wanted to visit the Galapagos for a long time*, and while I had thought about visiting in my 6 months off between med school and residency I only booked the trip about a month ago. My father (also an evolution nerd, Darwin enthusiast, and naturalist) and I travelled with National Geographic and Lindblad Expeditions on a trip to the Galapagos aboard The National Geographic Endeavour (named in honor of the first vessel that Captain Cook used in his explorations – the one that landed on the eastern coast of Australia; Cook never visited the Galapagos). I’ll just start by saying the company, the experience, the ship, the crew, the staff, the naturalists, the whole package- were all first rate. 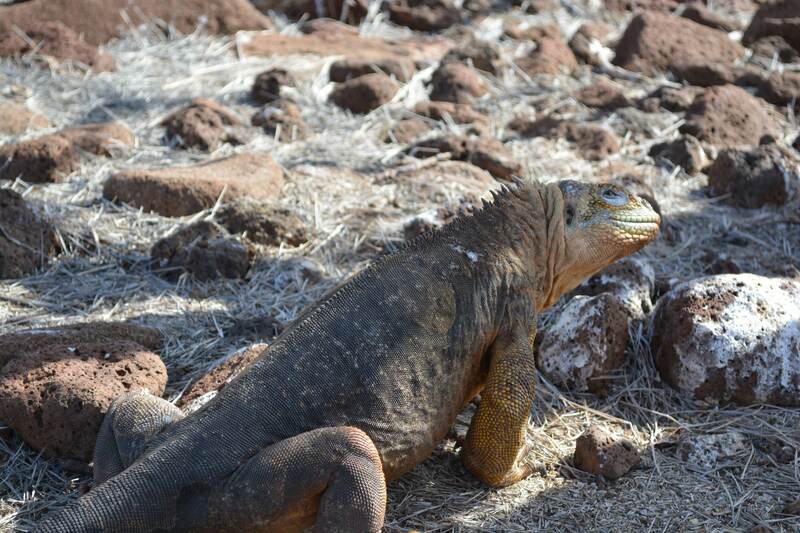 It’s a top of the line option for visiting the Galapagos, and it really shows. In many people’s minds, the Galapagos are inexorably linked with Charles Darwin and his theory of Natural Selection. Darwin visited the Galapagos, on HMS Beagle, in 1835. Darwin was aboard the Beagle for 5 years, but he only spent 5 weeks in the Galapagos of which only 19 days were on land! Nonetheless, the observations he made there and the samples he collected were important ingredients for his future theory. 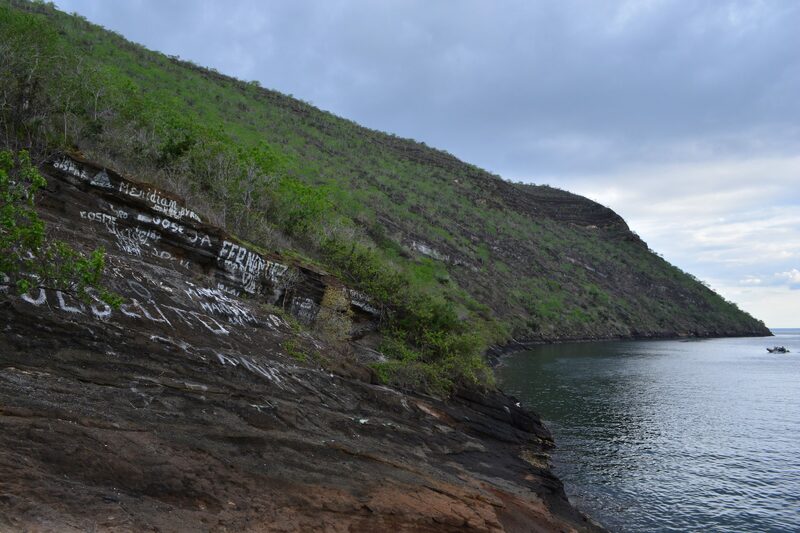 One evening we stopped in Tagus Cove- an area where Darwin landed. There is graffiti in this cove, as it was traditional (until recently) to leave the name of your boat on the cliffs (some are amazingly high up). The earliest inscription we saw was from 1836, the year after Darwin visited. Most of the walks we took on this cruise were rather relaxed, but this evening’s hike was a change of pace, and we made good speed up a steep trail. Looking back, we could see the Endeavour and a large pond that Darwin wrote about in The Voyage of the Beagle. Alas, while he was hoping for a refreshing dip in some fresh water, he was frustrated to find that this pond is brackish. A [disappointingly, at least for Darwin] brackish pond. I recommend the Galapagos chapter of The Voyage of the Beagle (Chapter 17). It is a delightful and quick read, and if you have an e-reader you can find it for free online. The Voyage of the Beagle was a travel journal of sorts, and while Darwin was the naturalist aboard The Beagle (well he was eventually, he didn’t start that way but eventually replaced the original Naturalist) he first became famous as a travel writer (his theory of evolution didn’t make him famous until quite late in life, and strangely his book on Barnacles wasn’t a big seller…). Over the years, the Galapagos became a popular stopping point for ships. While there is very limited fresh water, it was a good place to replenish food. Early visitors introduced goats (a species that quickly flourished on the islands, wreaking havoc on endemic creatures) and the Galapagonian tortoises were particularly popular as well. 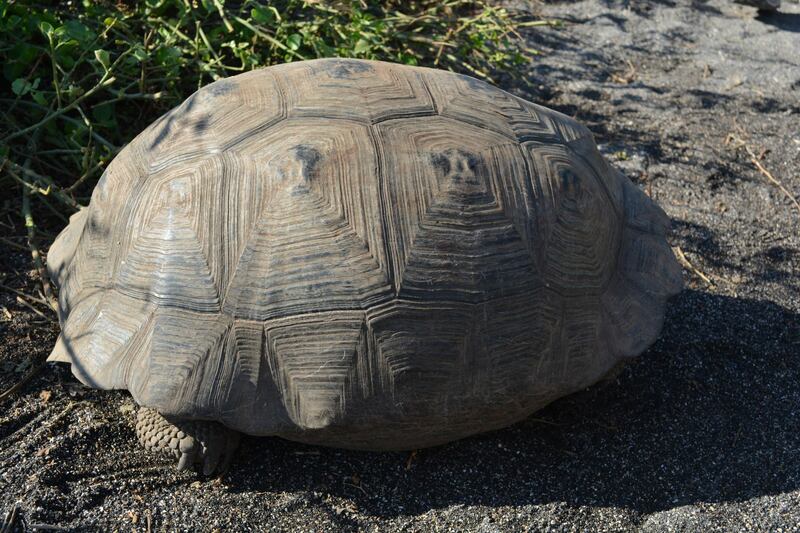 There are a number of species that are uniquely Galapagonian- the tortoise being a prime example. These giant creatures at one time roamed the islands in great numbers, but their populations were decimated by humans in ~150 years. The tortoise had two great misfortunes- first, they apparently taste pretty good (Darwin wrote of roasted tortoise breast “Gaucho style” being quite tasty, and was complimentary of tortoise soup (from medium sized animals), though he found nothing remarkable in the rest of the animal). Perhaps the greater misfortune for these giants is that they can survive for ~2 years without food or water. In a time before refrigeration, when fresh meat was almost an impossibility on long sea voyages, tortoises could be stashed on boats for ages until they were finally consumed. I admit to being rather bad about anthropomorphizing animals, but I can only imagine that being kept in the hold of a ship for over a year before being killed and eaten was a rather unpleasant end. A Medium Sized Tortoise- Perhaps this is a good soup-sized tortoise? These giants are believed to live over 200 years, though it is hard to be sure since we haven’t been studying them that long. 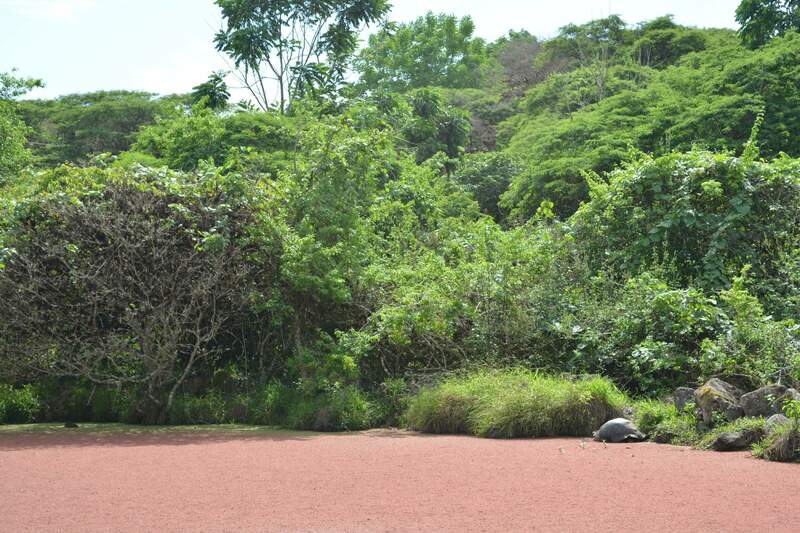 The tortoises on different islands are considered different sub-species (though where you draw the line at species vs. subspecies or variety was a common quandary during our tour of the Galapagos) and some have gone extinct due to human harvesting, competition (with things such as introduced goats), and decreased hatching (because of damage to nests due to introduced species). One of the most famous Galapagos Tortoises was “Lonesome George”, the last of his kind- a subspecies of tortoise that inhabited Pinta Island. While a number of attempts were made to breed George and “save” his kind, none were successful, and he died- the last of his kind- in 2012. 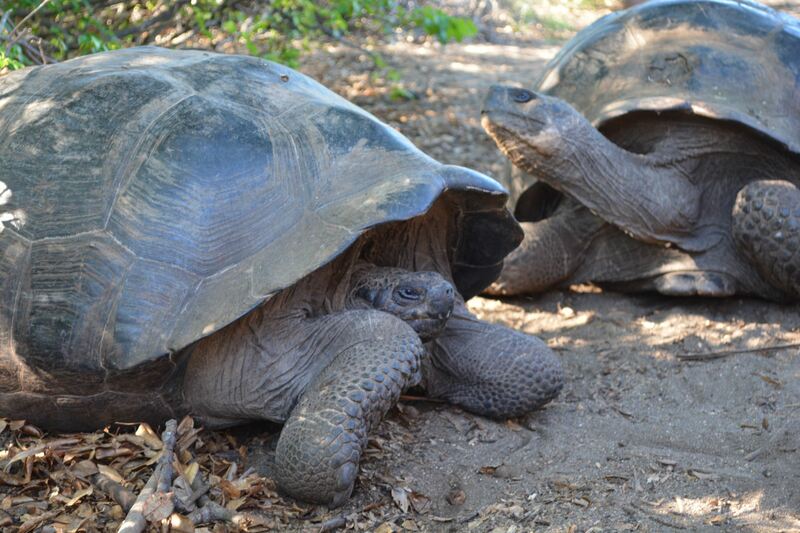 Lonesome George had been living at the Charles Darwin Research Station on Santa Cruz Island since his discovery in 1971, and for many years was the center’s most famous denizen. We visited Santa Cruz, and the Charles Darwin Research Center, during our cruise, and we got to see the conservation efforts there. The National Park manages 97% of the land of the Galapagos (only 3% is habited). The Charles Darwin Research Station does a lot of research, but only the national park can change policy and initiate change in the park. 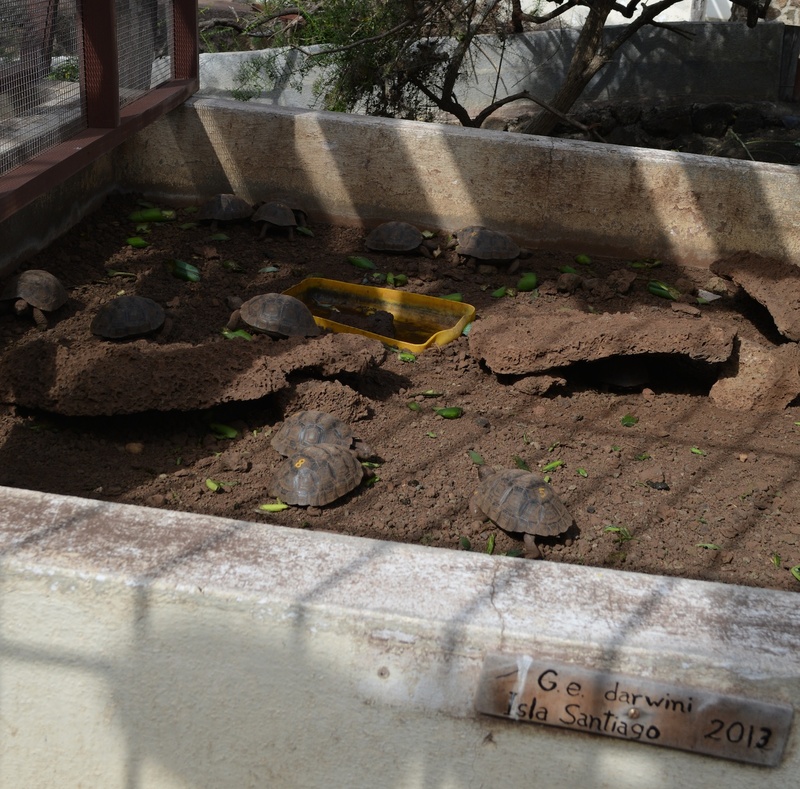 Eggs from different subspecies are hatched and reared in captivity on Santa Cruz (there are two other tortoise breeding centers elsewhere in the archipelago). When they are large enough to be released they are tagged and released. These efforts have generally been very successful and the tortoise population is recovering nicely. While they claim the number painted on the babies backs are for identification purposes, I secretly hope there is some illicit tortoise racing going on after hours! After his death, Lonesome George was sent to NYC where he was preserved by experts at the Natural History Museum. The current celebrity at the Charles Darwin Research Center is a much happier tale. When conservation efforts were initiated, there were only 14 tortoises of the Española subspecies- 12 females and 2 males. While conservationists hoped to build the population from these animals, the females were not interested in the males. 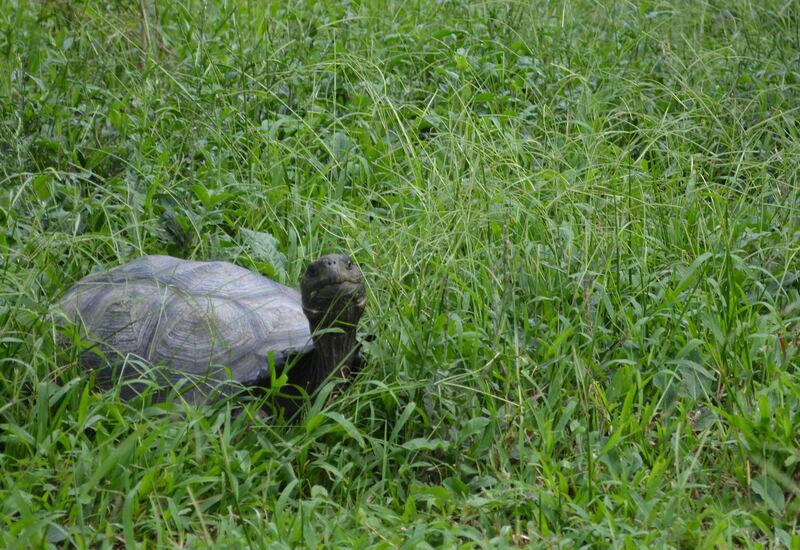 In an attempt to save the subspecies, a global search for a male of their kind was initiated- seeking out giant tortoises in zoos and private collections around the world. Eventually a male was found in the San Diego zoo, and after some negotiating “Diego” made his way back to the Galapagos. Now, having fathered over 1000 offspring, Diego is known as “Super Diego”, and the subspecies is doing well! 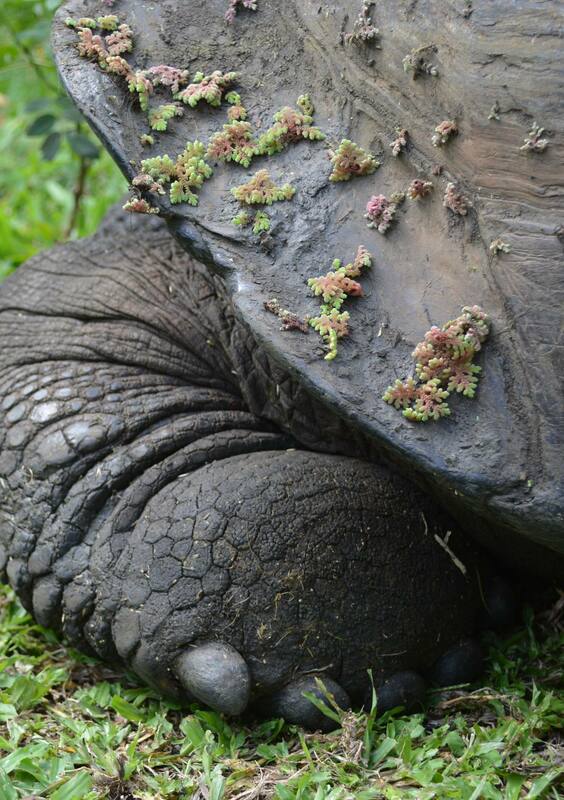 The conservation of the Galapagos Tortoises seems to be on the road to success, which is wonderful. The Charles Darwin Research Station has also had good success breeding and reintroducing some subspecies of Land Iguanas. In fact, the breeding program at the research center has now been closed because the efforts were so successful. These cuddly guys (land iguanas) have had a hard time on some islands, but with restoration and conservation efforts they are now dong well. There were slim pickings for the Land Iguanas on North Seymour. These guys like to eat prickly pear cactus, but were taking to the trees to find some greenery in this sparse environment. 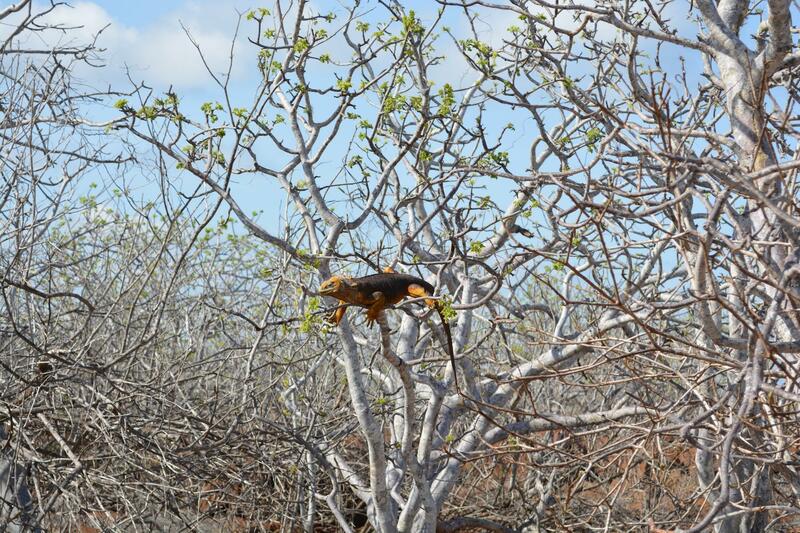 One of the naturalists we were with said he has never seen Land Iguanas so high in trees before. 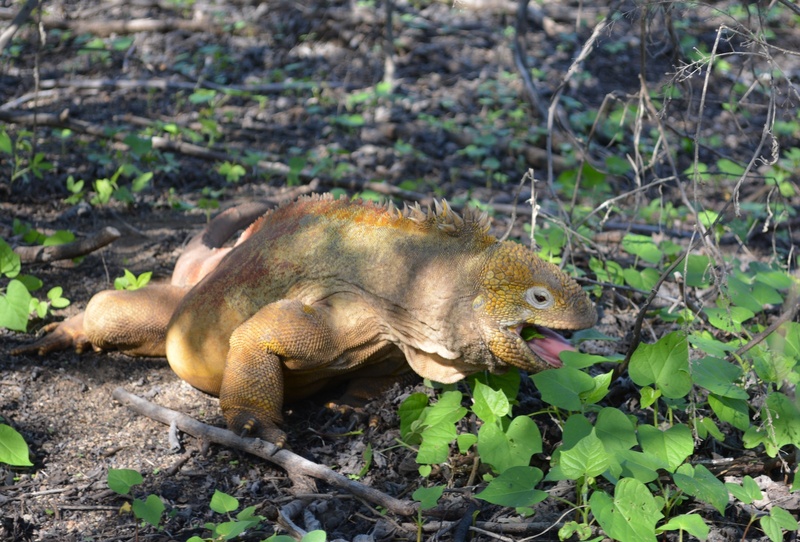 Lusher pastures for this land iguana near Urvina Bay. You may not know it, but about 30,000 people live in the Galapagos. 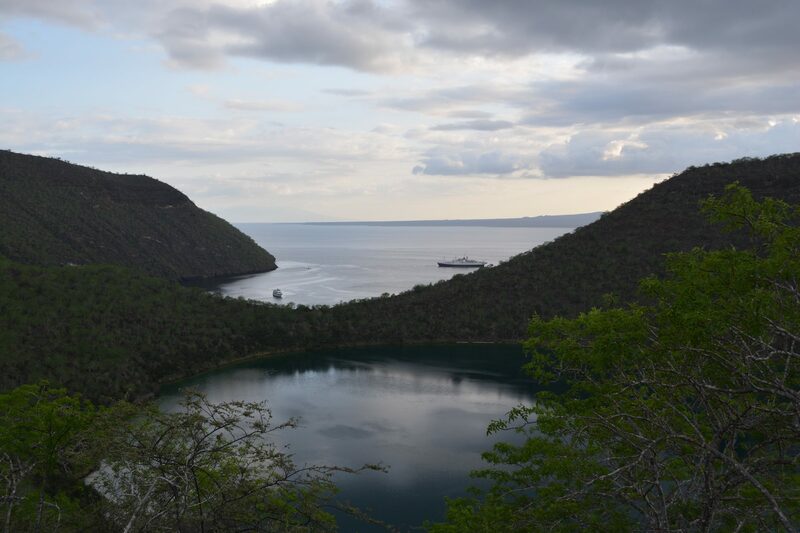 While 97% of the island is National Park (for which you need a permit and a naturalist to visit- no more than 16 tourists per naturalist), there are a number of inhabited areas. At the end of our cruise we visited Santa Cruz, where the Darwin Center is, and San Cristobal, from where we flew back to the mainland. In Santa Cruz we took a walk through town, and it was fun to stop at the fish market and see the catch of the day. Humans weren’t the only interested customers! A bit more anthropomorphizing… I imagined this Sea lion waiting for his number to be called at the deli counter. 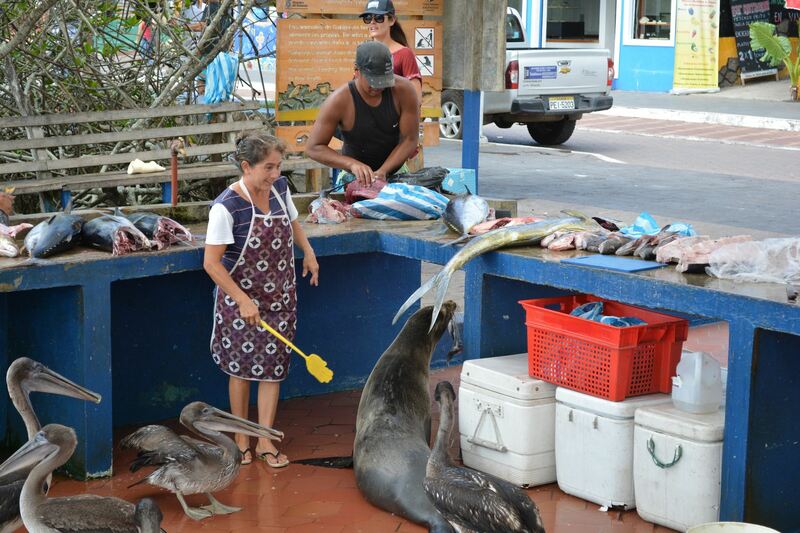 The Sea Lion was given a hunk of fish and the fishwife kept the pelicans back with a fly swatter so he could enjoy it! 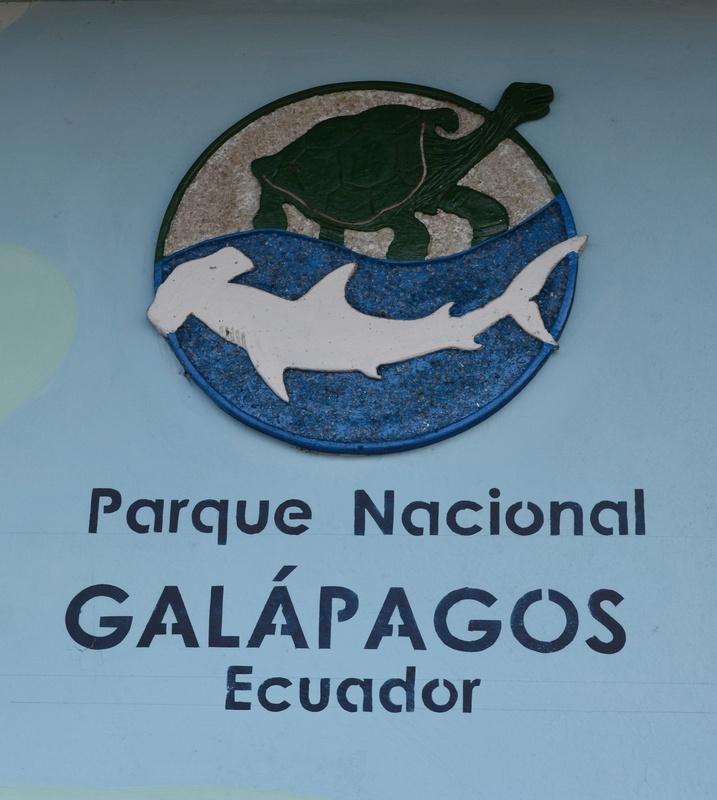 The Galapagos are part of Ecuador, and until fairly recently were not inhabited. Initially, colonists were “gifted” land, as encouragement to come and live in the Galapagos, but now there are significant efforts to curb immigration. When we were in Santa Cruz we headed up into the highlands to see tortoise in the wild (they much prefer to be in the highlands with lush vegetation and more water, but the females come out of the highlands to lay eggs- an unfortunate habit, since the smaller females were more desirable fodder for hungry sailors, and were much closer to the ocean than the large males who stayed in the highlands). The tortoises in the highlands like to relax in ponds such as this one. They will drink gallons of water when they visit, but can go years without water in hard times. At first I was confused by the shrubbery this tortoise had acquired, but after seeing them wallowing in the weed-covered pond all became clear. Unfortunately, this method of hiding didn’t save tortoise from hungry sailors. Darwin writes how sailors would flip these hiding beasts over and carry them off to the ships for storage. While we were in the highlands we visited a plantation where a family grows coffee and sugar cane. 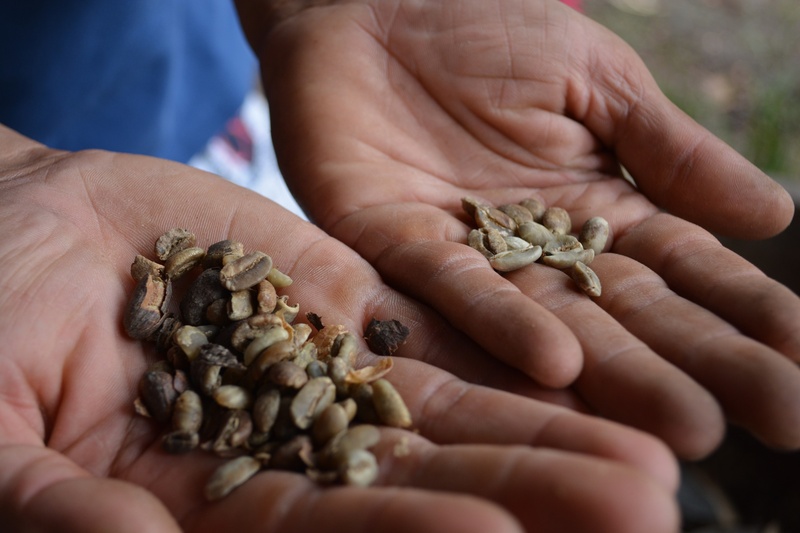 Both grow well in the Galapagos, and while we visited we learned how people traditionally processed sugar (into molasses and alcohol) and coffee. 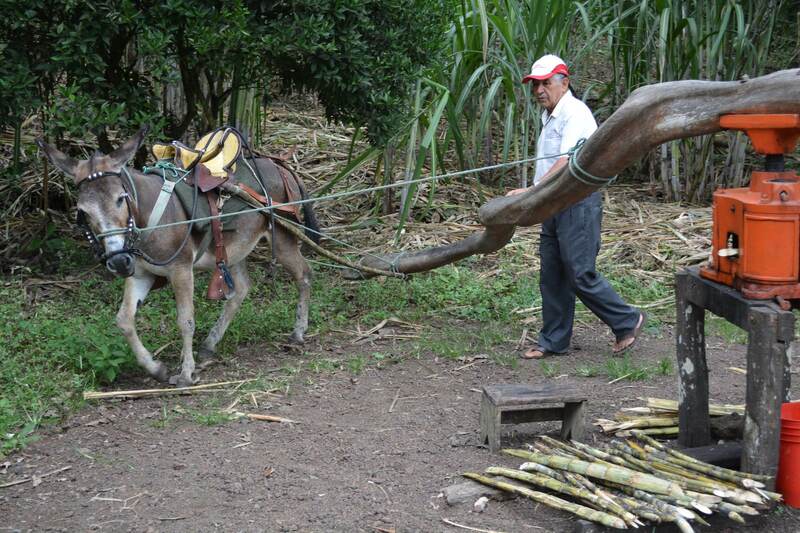 Sugar Cane processing- This isn’t how the family processes sugar today, but this is the traditional method. Sugar cane is fed into the press and juice comes out the bottom. On this plantation half of the sugar cane juice is made into molasses and half is made into alcohol! 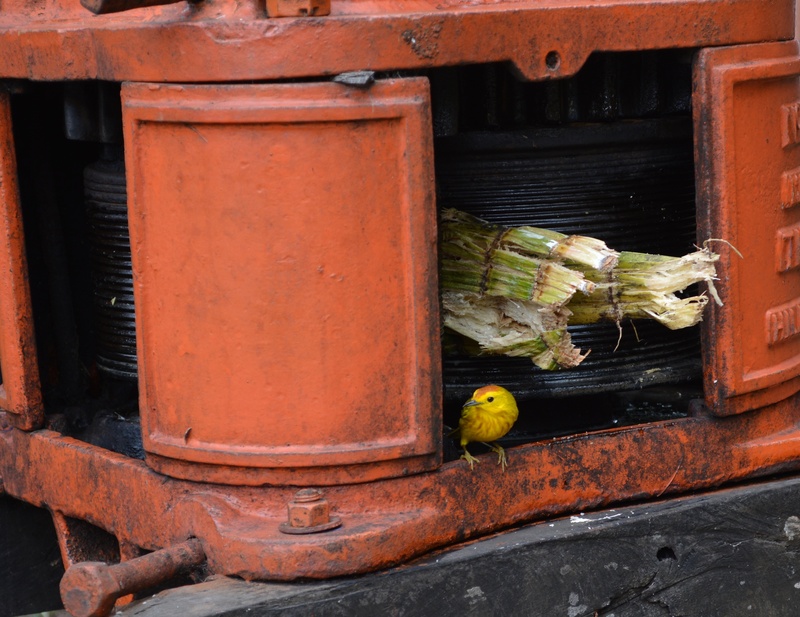 Diabetic Warbler?- This Yellow Warbler really liked to hang out on the sugar cane press! 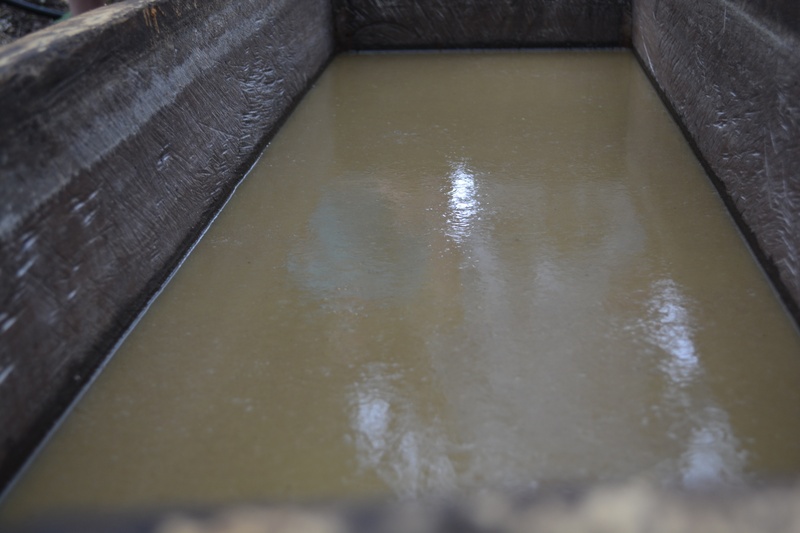 Hooch- this was the open vat where the sugar cane juice was fermenting. The final product, after it was passed through a still, was… rough. There’s a reason people age rum! 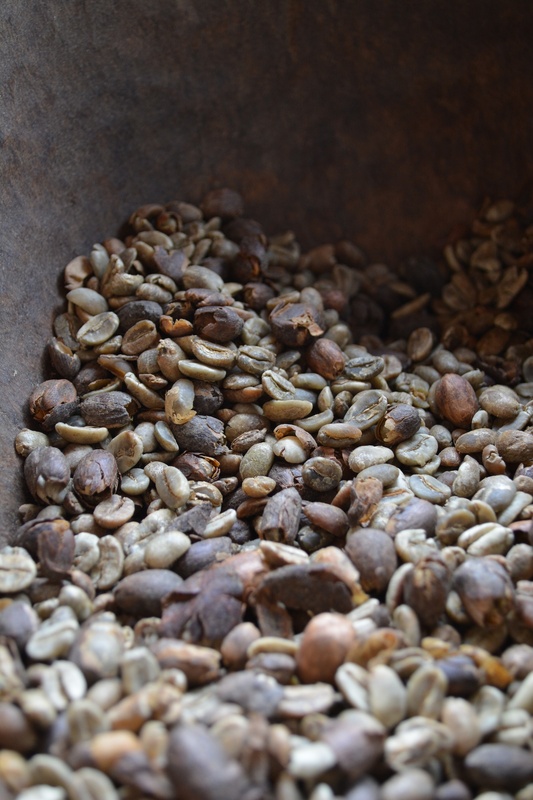 Having had an introduction to traditional coffee processing methods in Belize, I got a review in The Galapagos. Here you can see the unroasted uncleaned and cleaned beans. We got to try coffee beans, sugar, coffee, sugar juice (delicious with a squeeze of lime), and hooch (ditto). 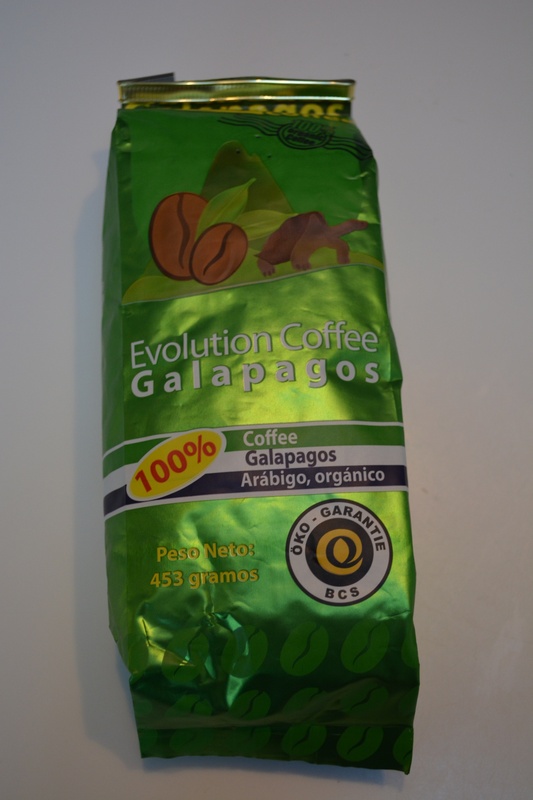 While I certainly took lots of pictures in the Galapagos thing, the only physical product I’m coming home with is some Galapagonian Coffee. Admission time- Label something “Evolutionary” and I am 27% more likely to purchase it. I have a lot more to write about, and many more pictures to share, but this seems like a good stopping point for now. I’ll get the next post up ASAP, but it may be a bit of a wait since I head to the UK tomorrow for a quick visit with family. 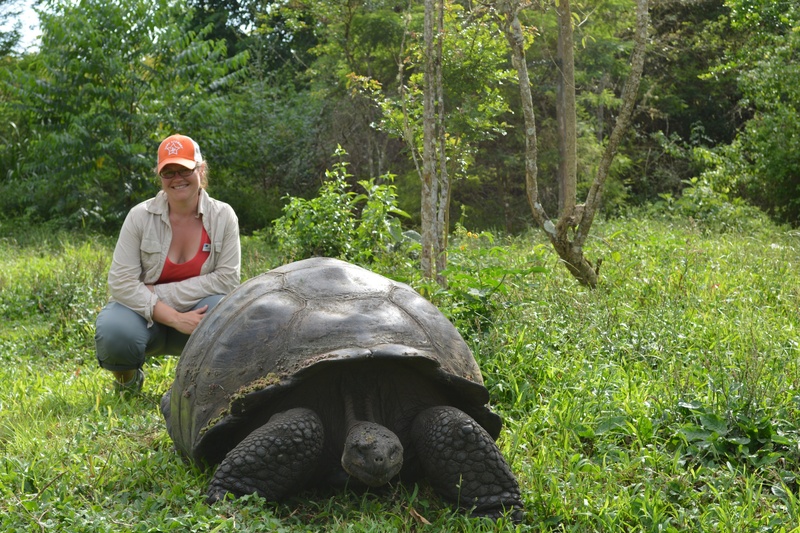 *While I have always been keen to visit the Galapagos, I have also been somewhat wary. 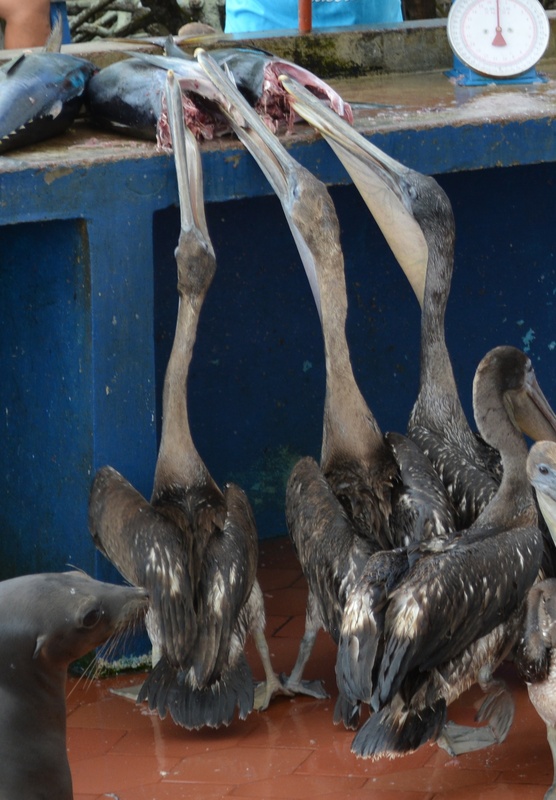 There is no doubt that humans have done a lot of damage in the Galapagos. While the bulk of this damage was done by early visitors who purposefully introduced a number of hardy species, tourists certainly have the potential to damage the environment, spread seeds, and introduce species or disease. 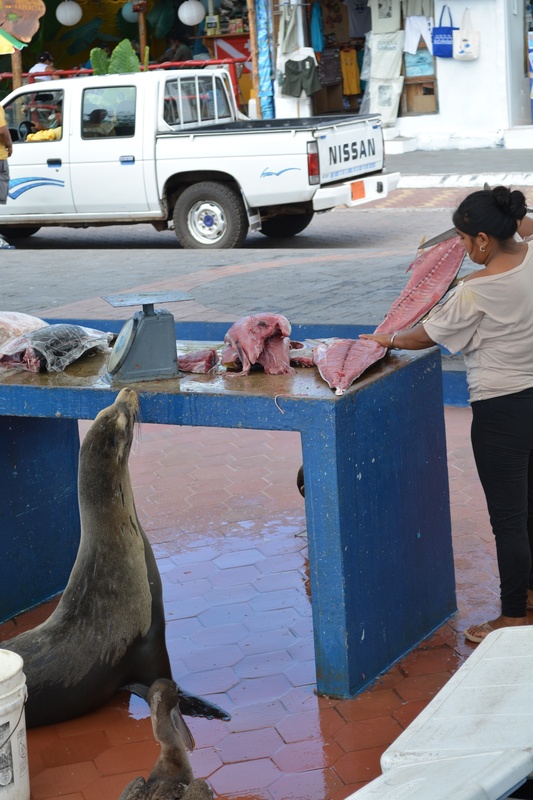 That being said, done correctly, tourism can be an incredible force for good in the Galapagos. A lot of damage has been done in the past 200 yrs by sailors, settlers, and visitors. Progress is being made to repair these damages, with money coming largely from tourists. If humans were to now abandon the Galapagos, the endemic species would be pushed out by species that have already been introduced. Well-regulated tourism, appropriate management of the land, and conservation efforts can help preserve the Galapagos. They are certainly a wonder worth saving. Yesterday I posted some thoughts and pics from my recent adventures in Belize… Here’s round 2! In yesterday’s post I mentioned going on a photo shoot of the twin cities with NICH (the National institute of Culture and History). 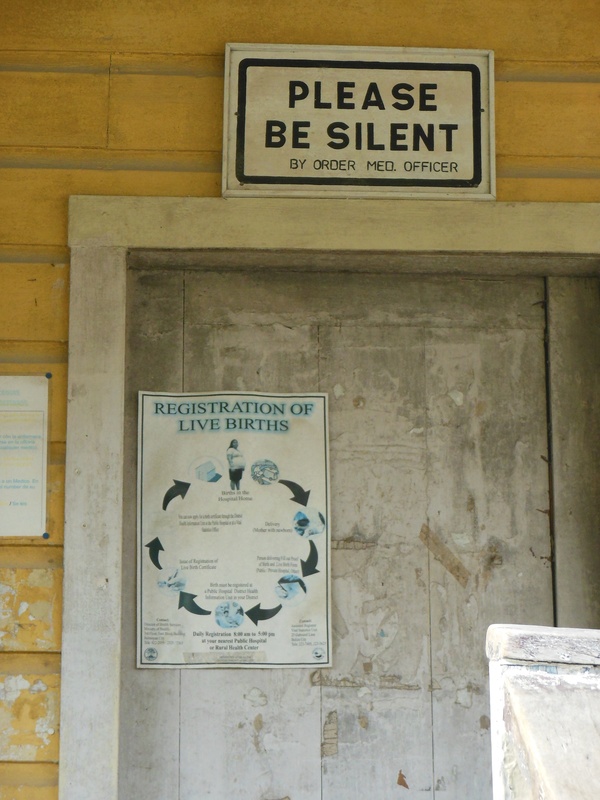 One of the stops on our tour of San Ignacio was the old hospital. This hospital was closed about 7 or 8 years ago, with a new hospital now operating on the outskirts of town. The old hospital now sits in disrepair, slowly disintegrating. Being a medically-minded person, I found this stop on the tour very interesting. The abandoned walk in clinic. A sign of the times. This explains how you register the birth of a baby delivered at home. I didn’t take any chemoprophylaxis for malaria (I’ll admit I didn’t even think about it, though I have had Hep A vaccines- something generally recommended for travel in this part of the world). Interestingly (disturbingly?) 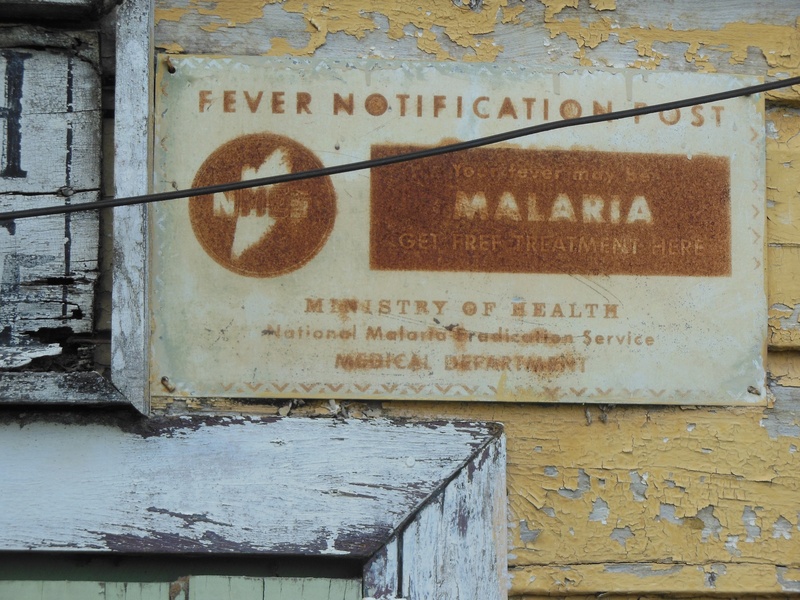 the CDC and NHS disagree about malaria risks in Belize. The CDC says Cayo, where I spent most of my time, is an area where chemoprophylaxis is advised, while the NHS says it is a low risk area with no need for prophylaxis. Hmmm…. I spotted this cot in the abandoned hospital, and immediately recognized it as a Cholera Cot. These are one of the things doctors learn about in med school but will never see in the US. Cholera causes MASSIVE fluid loss by diarrhea. Cholera cots are designed with a hole in them so a bucket can be placed under the patient to measure fluid loss. Replacement of fluid and electrolytes with Oral Rehydration Therapy is amazingly effective for this otherwise very deadly disease. Confirming my suspicion, I saw this plaque on the wall in another room. There’s definitely a push to teach kids about healthy living. I thought this mural on a school wall was much better than the USDA food pyramid, but maybe that’s just me… Unfortunately, I saw kids eating a lot of junk food in Belize- candy, chips, and Coca-cola are ubiquitous in Belize (note- there is no Pepsi in Belize- they were run out years ago. Bowen and Bowen dominate the beverage industry in Belize). 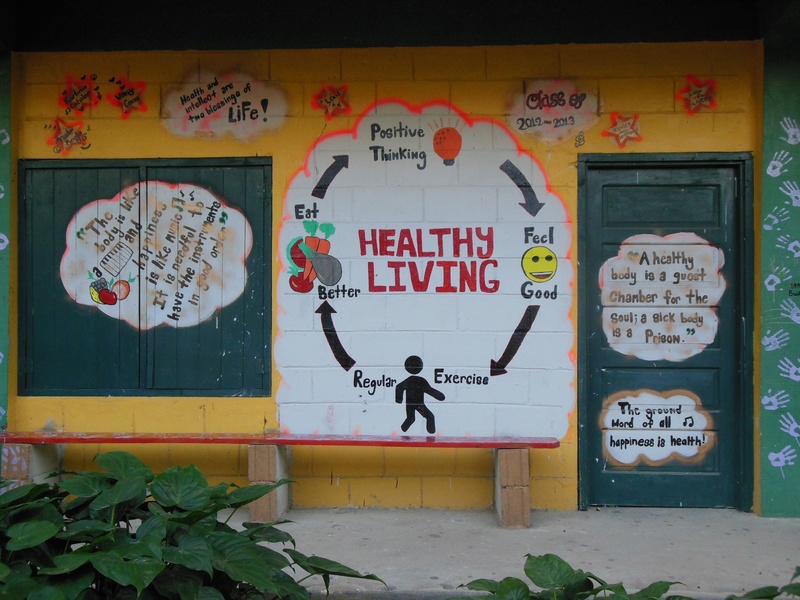 Despite the abundance of junk food, the children in Belize are very active and generally appear to be thriving. I joke that Belize is very much a country of free-range chickens (they’re everywhere) and free-range children (they’re everywhere too). You frequently see young children out playing on their own, babies and small children being cared for by siblings, and small kids walking home alone from school in their uniforms. They’re an active bunch (perhaps because few, if any, have home computers or smart phones? ), and find opportunities to play everywhere. School yards are generally rather bare, but you’d often see kids playing with old tires and barrels. I’ll admit that I found their love of play mesmerizing and inspiring. 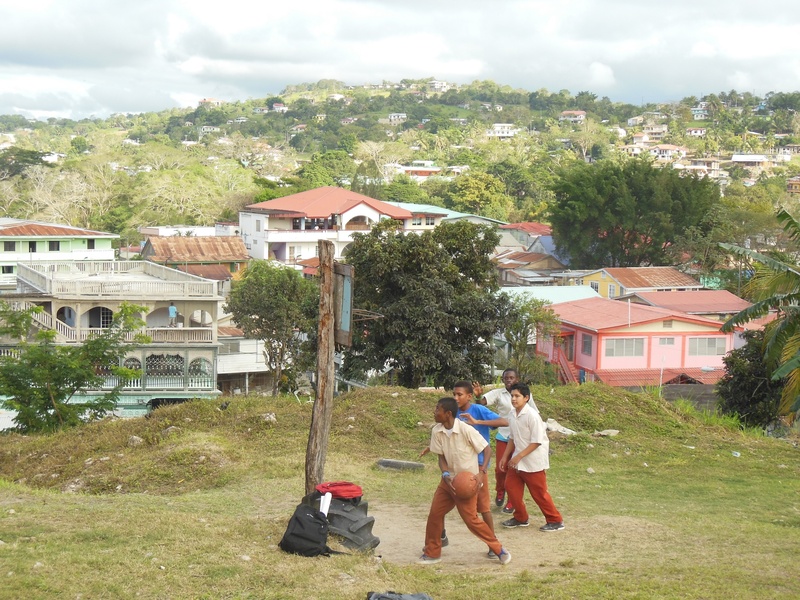 These kids were on break outside their school in San Ignacio. I watched at another school where kids sprinted outside to take advantage of a ten-minute break between classes. They spent the time sprinting up a construction embankment (not a “Caution” tape in sight). More “free-range” kids. These girls kept running up to this painting of Jesus and giving him hugs. There have been a lot of missionaries in Belize over the years. Pentecostals, Nazarenes, and Mormons have all tried to make inroads into this culture. I went through customs behind a group of young Mormon missionaries. Dogs are also generally left to be “free-range”, often with tragic results. 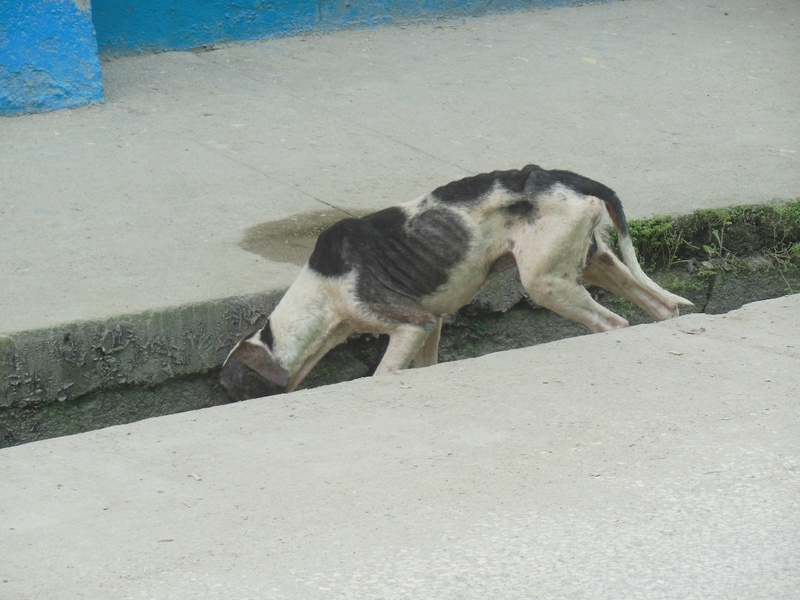 It’s rather heartbreaking to see the starving, mangy dogs all over the streets. 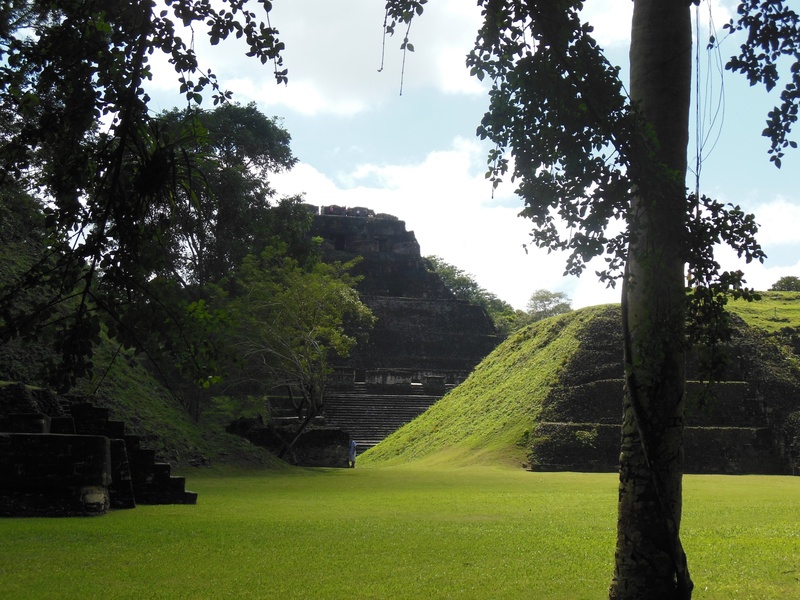 Xunantunich- There are a number of Mayan Sites in Belize. Xunantunich (sounds like zoo-nan-tune-itch) is just across the river from my friends’ house. Not only did I visit to see the archeology, but the 1-mile trek up the hill to the entrance became a favorite walk when I had spare time. You have to take a ferry across the river to get to the site. The ferry is hand-cranked, and carries pedestrians, cars, and horses! Xunantunich grounds are about 1 square mile, and contain a number of structures. 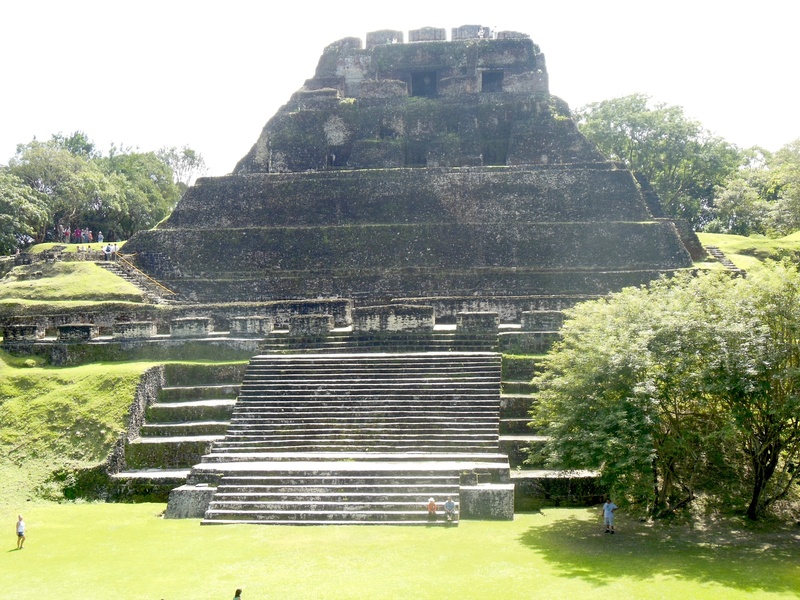 El Castillo (The Castle) is the tallest structure on the site and the second tallest structure in Belize. 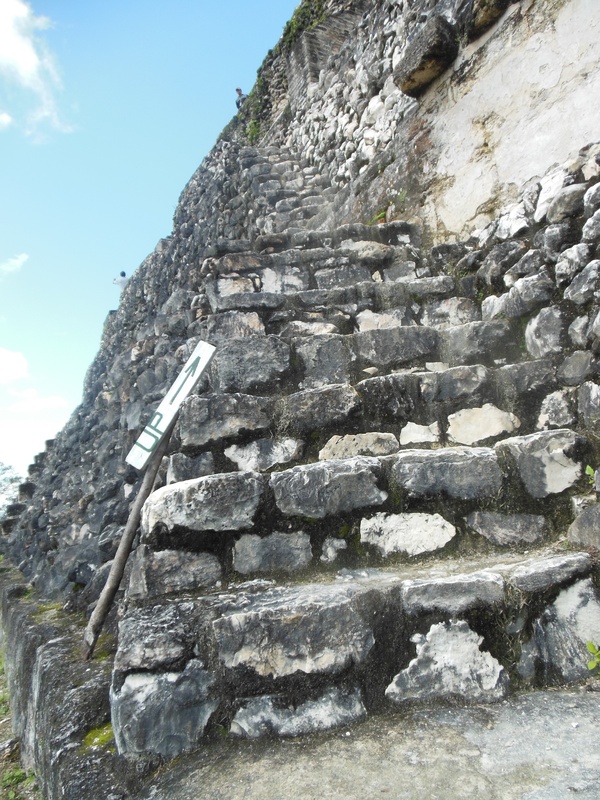 It’s a great climb to the top of El Castillo. You get beautiful views of Guatemala and Belize on the climb up. From the top of El Castillo you can see how the structures line up. 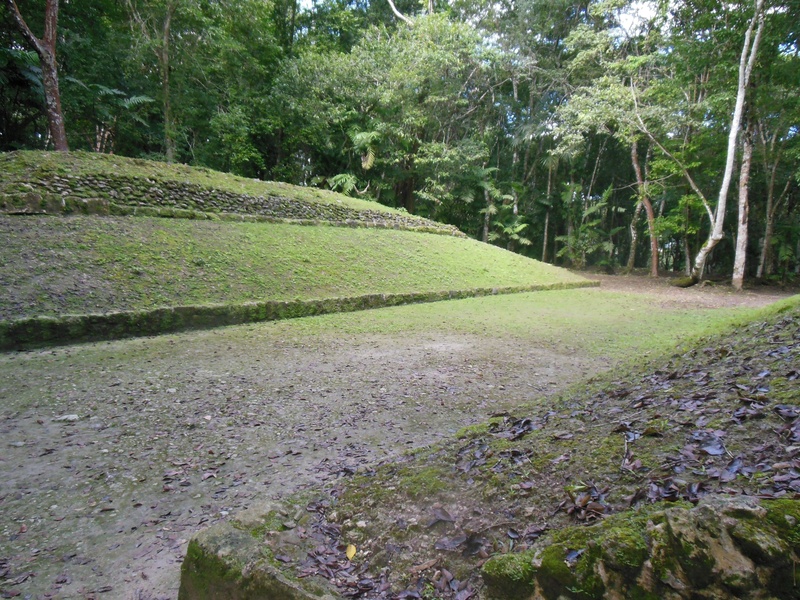 Many Mayan sites are lined up with a north-south and east-west axis. At Xunantunich, El Castillo is at the center of these two axes. 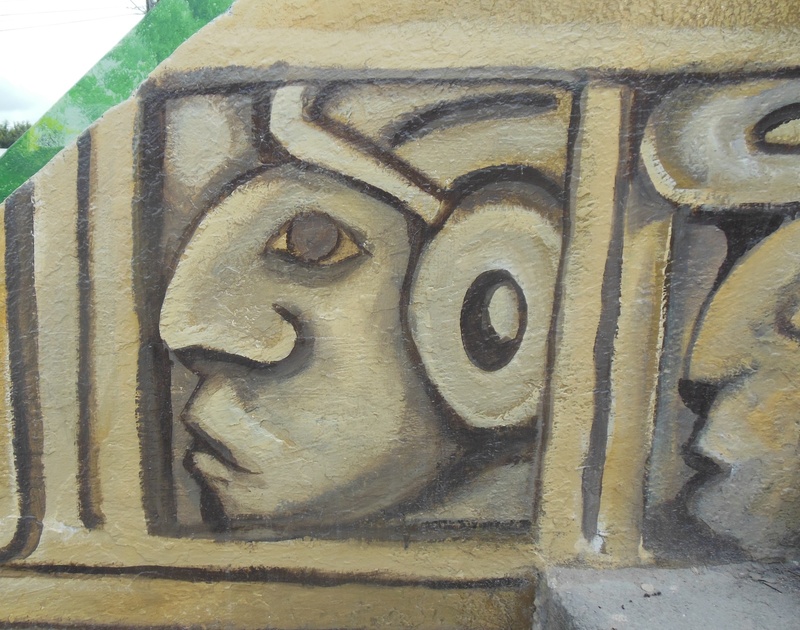 There are a number of beautiful restored friezes on El Castillo. 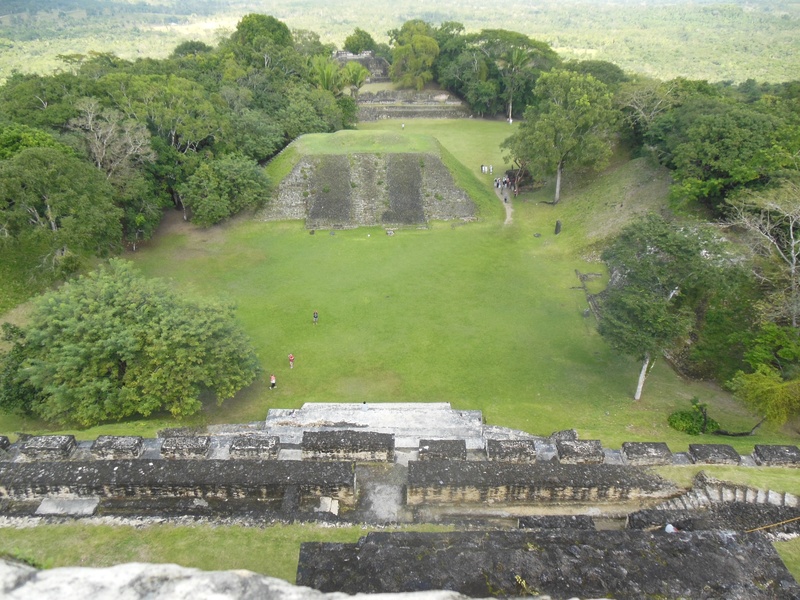 There is a significant Belizian Defense Force (BDF) presence at Xunantunich. It is very close to the Guatemala border, and there have been problems with people illegally coming across, mugging tourists, and then running into the jungles. On one of my morning walks one of the guards used my scent to practice with his German Shepherd trained for tracking(!! ), and you frequently saw soldiers with big guns patrolling the roads and ruins (though initially a bit intimidating with their big guns, a number of them were very chatty when they realized I was a frequent flier on their territory). My friends took me on a few cool road-trips while I was visiting. 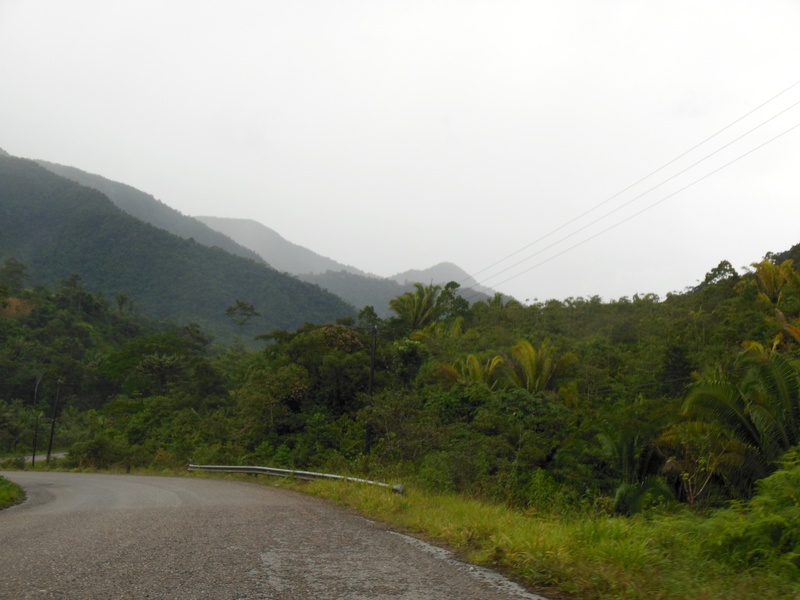 I snapped this on our trek from Succotz to Placencia, as we travelled on the Hummingbird Highway- yes, this is a highway! 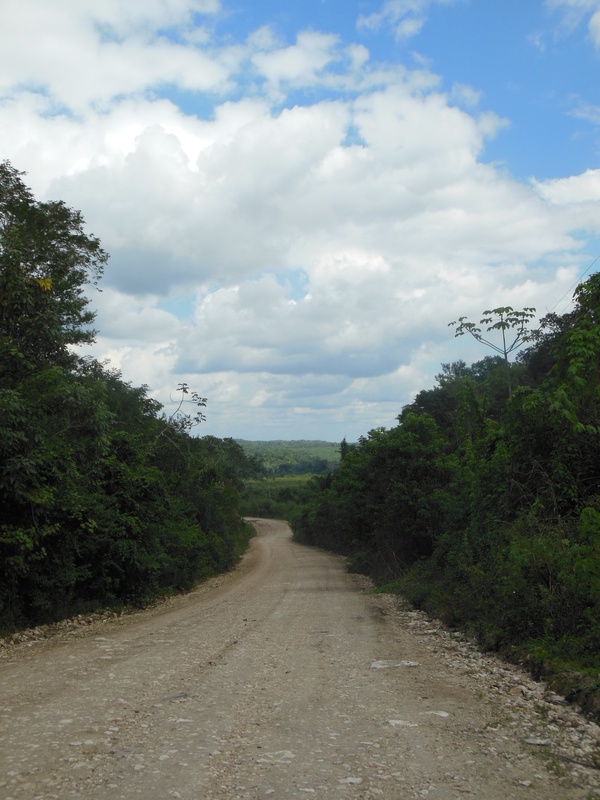 The roads in Belize often leave a lot to be desired. A good 4X4 vehicle is frequently needed! I snapped this as we took a walk in the Guanacaste National Park in Belmopan. Here we saw (and more notably heard!) Howler Monkeys, which I think should more accurately be called Roaring Monkeys! 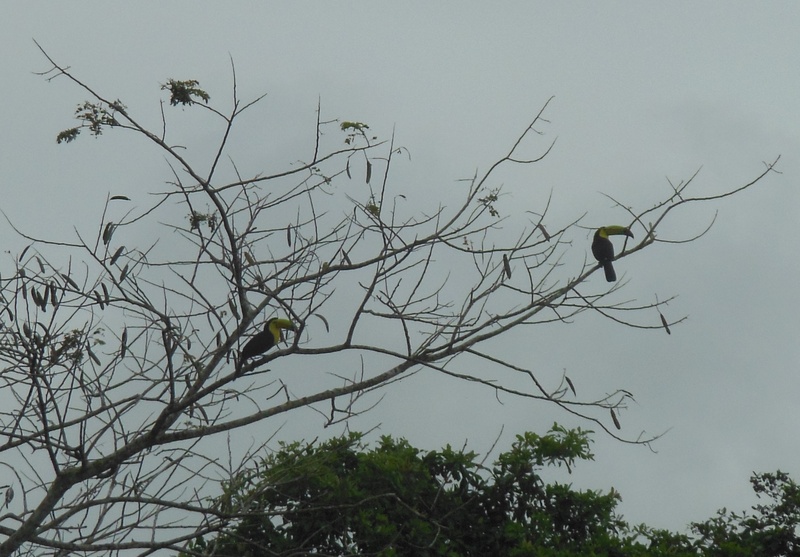 I spotted Toucans a couple times in my travels around Belize. I saw this pair on a walk down from Xunantunich. 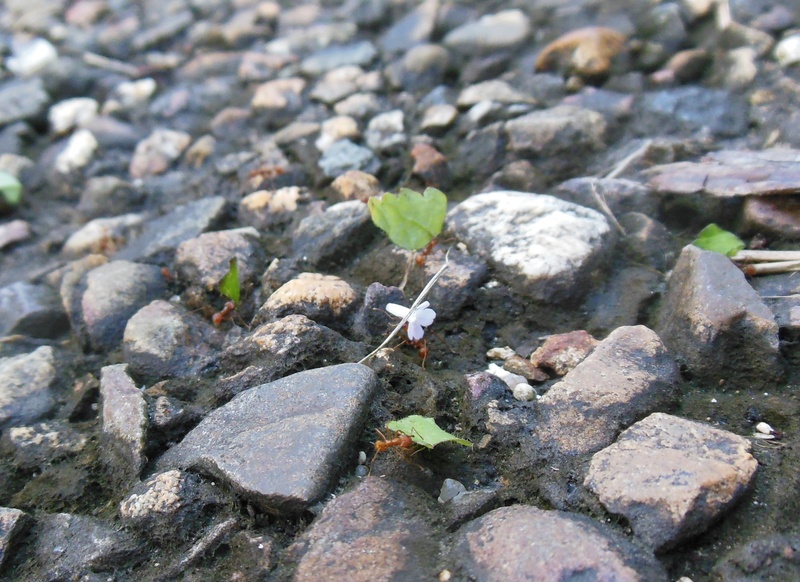 I also spotted leaf-cutter ants a few times. I particularly like the little fellow toting a flower. It’s impressive that these teeny little ants actually beat a path into the grass as they work. 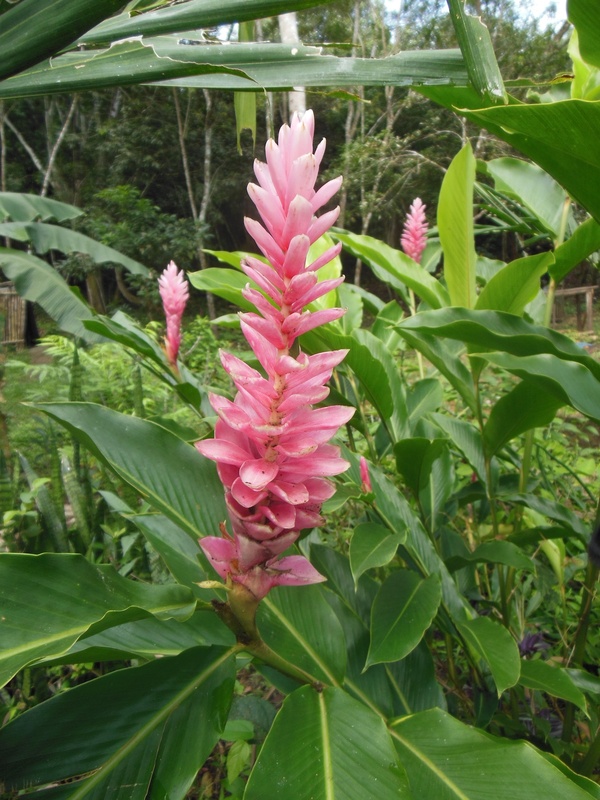 On my first day in Belize we headed into the jungle to walk around the grounds of a herbalist. 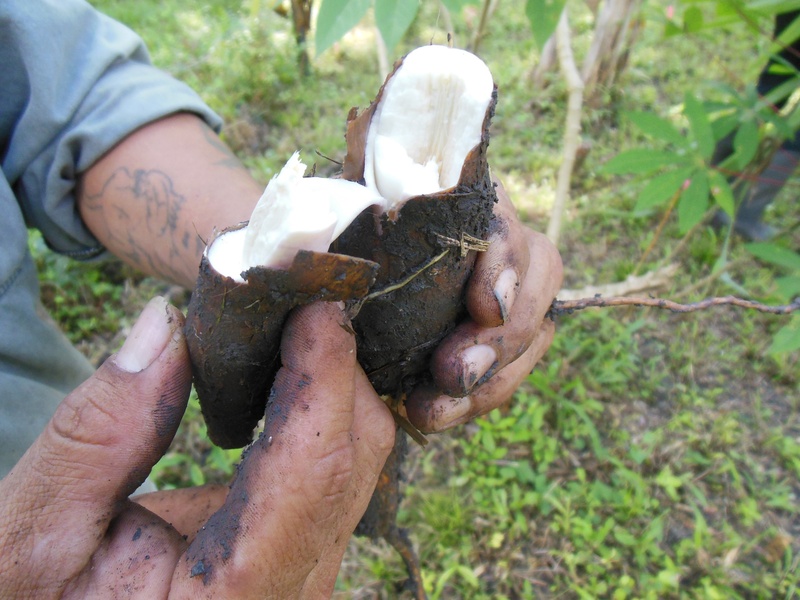 We saw a number of medicinal and edible plants there, including this Cassava. 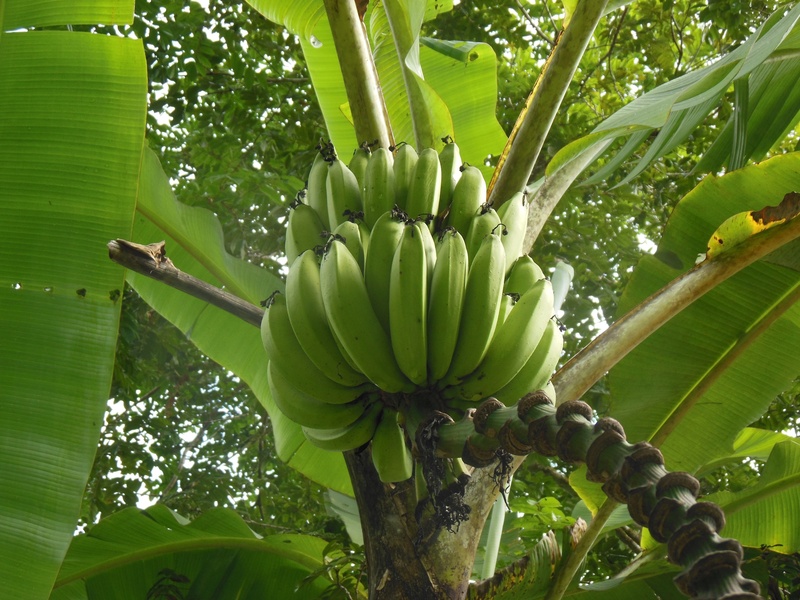 Bananas grow with abundance in Belize (this pic was taken in someone’s yard, but we also drove through miles of a banana plantation on our way to the coast). Life is abundant in Belize. It almost seems as though this Orange Tree has more epiphyte biomass than Orange Tree! Speaking of Oranges… Talk about something you probably wouldn’t see in the states. 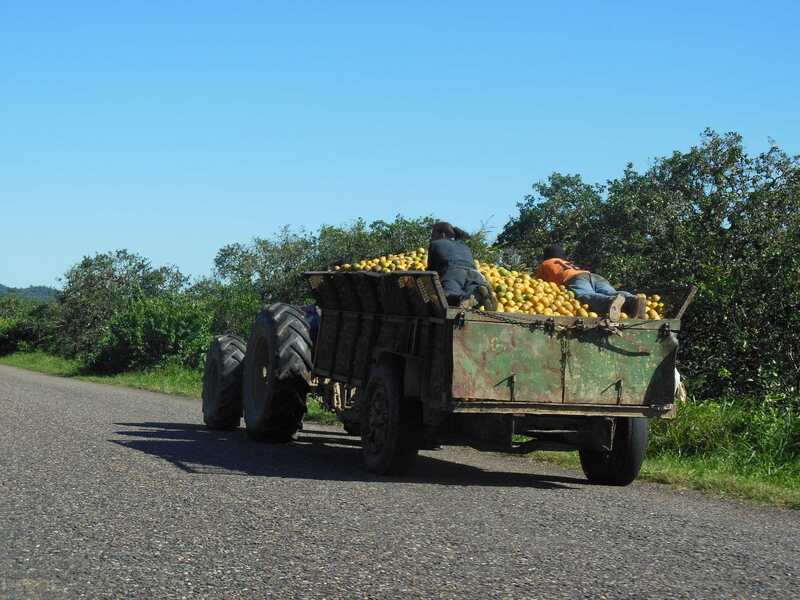 These workers were catching a ride as this tractor sped down the highway laden with oranges. This sight was by no means unusual. Traffic rules (well, rules in general) are pretty lax in Belize. There’s no such thing as vehicle inspection, and most of the vehicles would not be deemed road-worthy in the US. I saw more cars without brake lights than I saw with. It’s not abnormal to see cars with a paucity of lug nuts. Shocks are a luxury, and carrying capacity is only limited by your imagination. 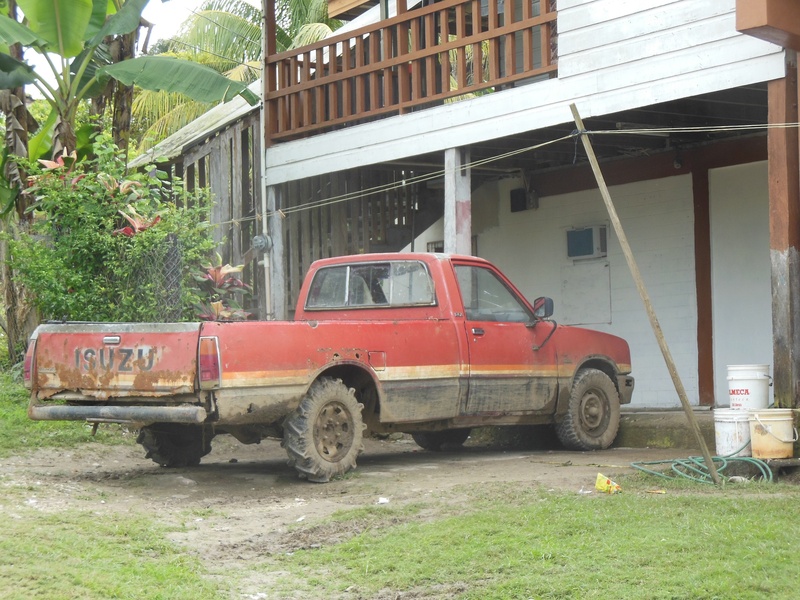 A pretty typical Belizean vehicle (check out those rear tires! )… It would be fun if the vehicles came with biographies (I think many make it to Belize after being written off in other countries). The per capita GDP of Belize is 1/5 of the US, and the standard of living is very low. 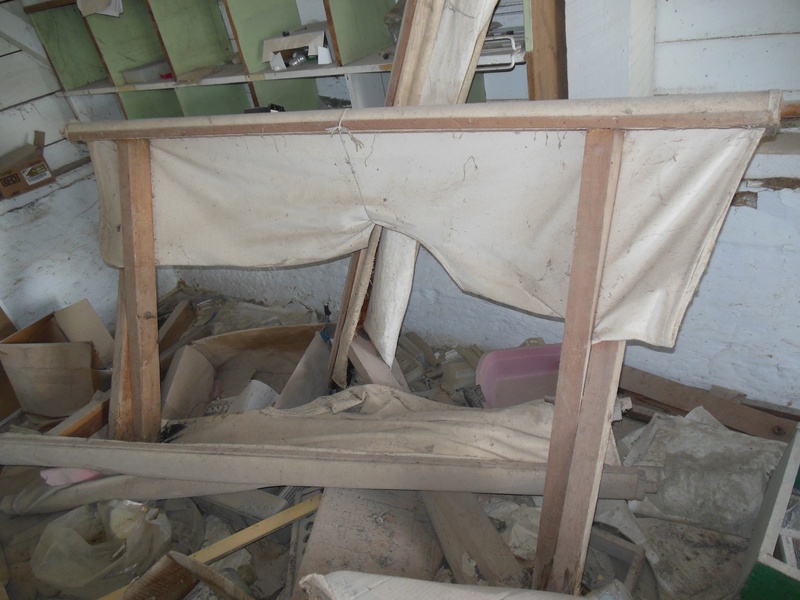 People live in very crude houses- often just one or two rooms for a rather large family. 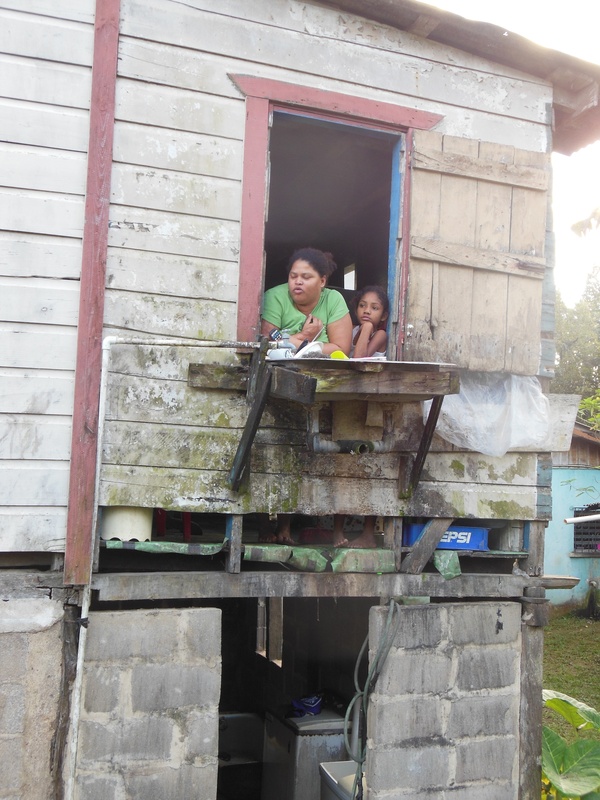 While touring San Ignacio with Hector Silva (check out my last post for more on this interesting fellow) we stopped to chat with this woman… Check out the family’s living situation- you can see their feet from the outside (I suppose it makes sweeping easier), and their sink is outside their window, draining directly onto the ground below (warm running water is a rare luxury in Belize). Chatting to us over the kitchen sink. Despite the very basic way of life in Belize, people there seem genuinely happy. There certainly are hardships, but families seem strong and supportive, children well adjusted and happy, and life is generally good. Animals don’t get the care or attention that most of us have come to expect (I mentioned the dogs above, and horses are frequently very malnourished and scrawny), and I hope that with time and tourism there is greater respect for the environment. I do hope to return to Belize again in the future. It is a nice treat to visit a warm and sunny place during the depths of winter, and there is a lot to learn and appreciate in Belize. NB- playing in the jungle isn’t without risk. When I visited the Yucatan as a college student I discovered that I am acutely sensitive to Black Poisonwood, also known as Chechem. In Mexico I developed blisters on my legs when I unwittingly came in contact with the plant, and despite being very aware of the tree when I visited Belize 8 years ago I still somehow came in contact with some and again got blisters. 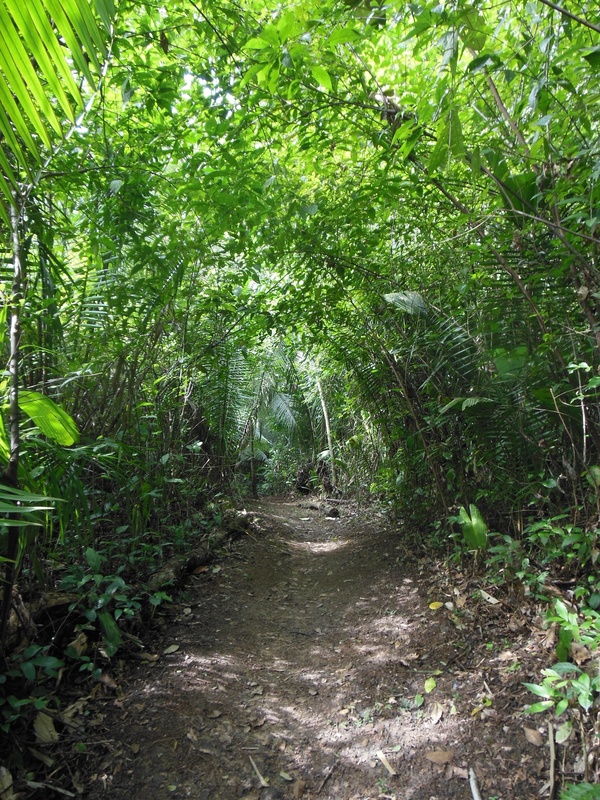 On one of my morning walks up to Xunantunich I went off the beaten path and down an overgrown 4X4 trail. It seems that I again got in contact with Chechem, and developed a chemical burn on my neck (no, it’s not a hickey, I promise!). 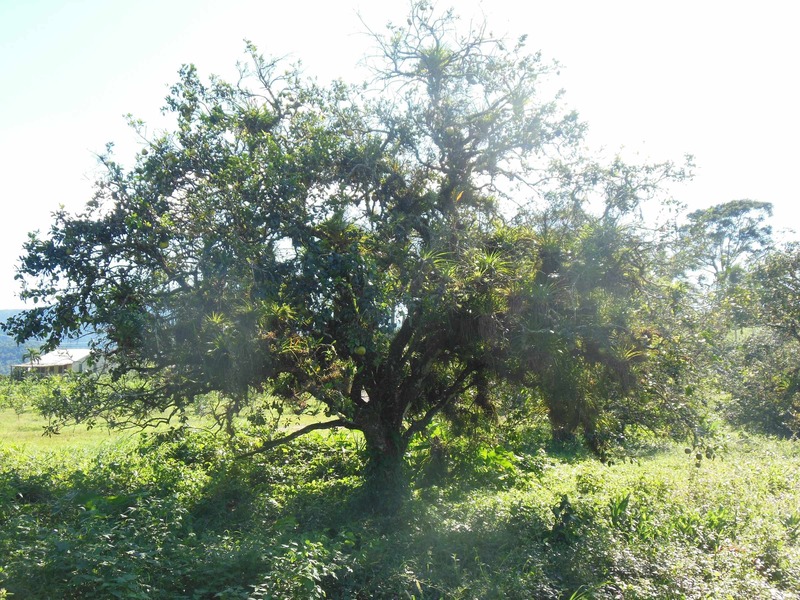 The traditional remedy for this is topical application of sap or tea made from the bark of the Gumbo Limbo tree. While I was in Belize I used this remedy, and it did seem to help, especially on my arms where I got a rash (I believe) from walking under a poisonwood tree while it was raining (as I said, I appear to be acutely sensitive). 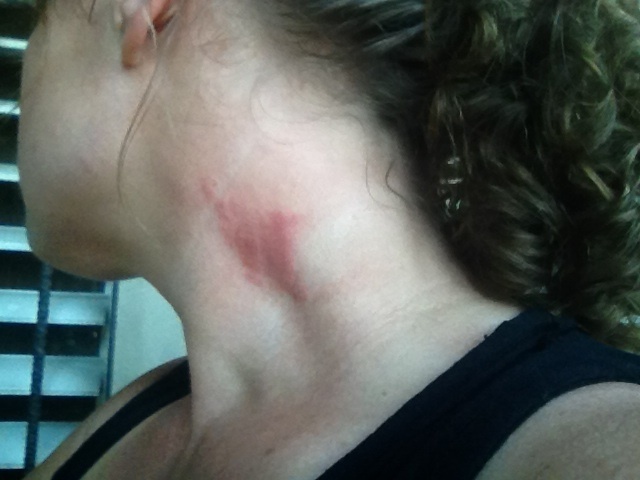 A Chechem induced chemical burn on my neck. There are other notable risks of visiting Belize. 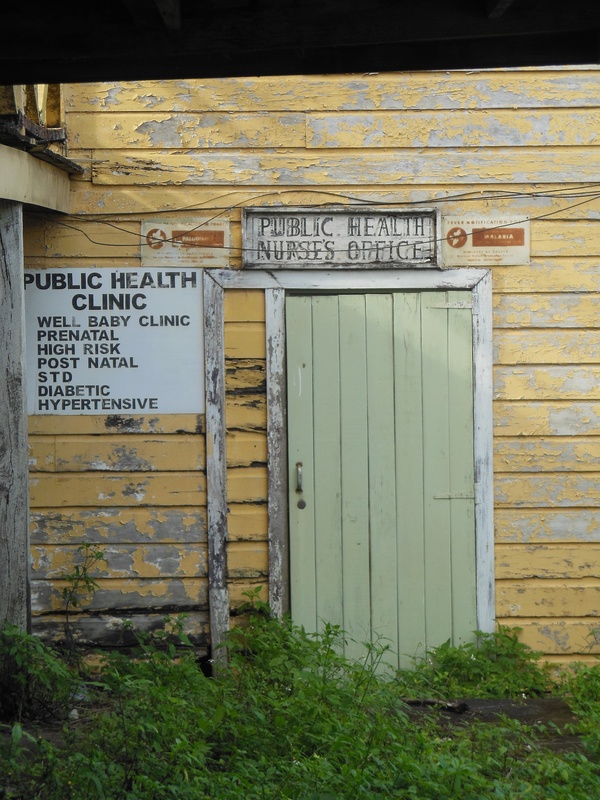 I saw a number of public notices touting that Belize has the highest rate of HIV in central America. I also saw public notices warning about the prevalence of Chagas disease. In some areas of Belize, the risk of Leishmaniasis is significant, and a friend of the friends I was staying with recently had a cutaneous lesion. I was sorry to leave Belize (especially because a storm hitting the east coast delayed me in Houston overnight! ), but I am excited to be getting ready for my next adventure. Tomorrow morning I head to Ecuador, and on Saturday I head to the Galapagos! For a Darwin enthusiast, this trip is an opportunity of a lifetime, and I will endeavor, while aboard the National Geographic Endeavor to experience the Galapagos to the fullest (and hopefully share my experience here). The tagline for this blog has always been “Ramblings of an evolutionary-minded future-physician.” I started this blog thinking that most of these “ramblings” would be verbal, but for the next few months these ramblings are going to get a bit more “real”. In the next few months I plan to write more about my physical ramblings (though I do hope to squeeze in some “academic” posts as well), as I will be traveling rather extensively. Having finished my medical training in November, and my trek along the residency interview trail (a rambling story for another post), I am now using my “free time” between graduation and the start of my intern year (which kicks off at the end of June) to travel as much as possible. 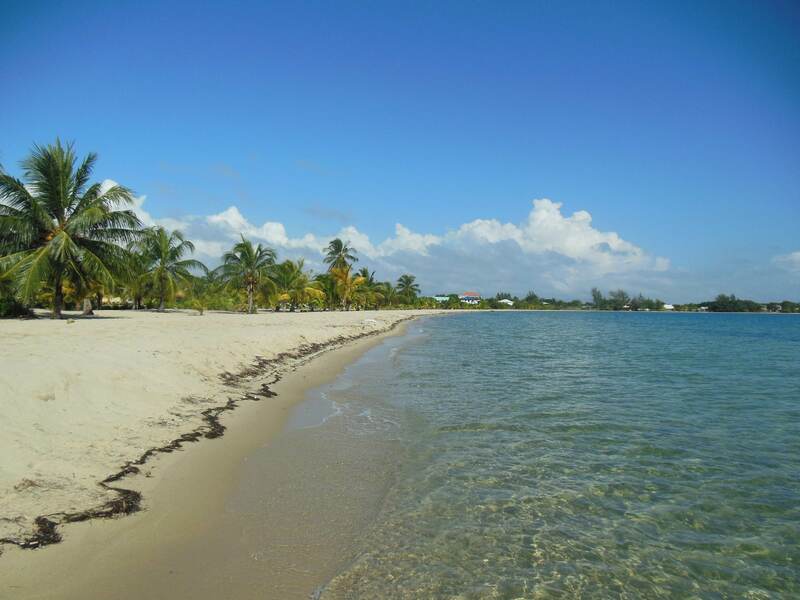 The first stop on my itinerary was Belize. I visited Belize with my Mum about 8 years ago during Spring Break of my first year of medical school. On that trip I rode horses through the jungles and mountains, and then headed to Caye Caulker where I relaxed on the beach, did some diving, and studied physiology (Or at least I tried to study a bit… my school had cruelly scheduled an exam for the Monday after our return from break!). I returned to Belize this time at the invitation of friends who moved there about a year ago. (Let this be a warning- if you invite me to come visit, I’ll probably try and take you up on it! I much prefer travelling to places where I know people so I can get an insiders perspective instead of a tourist experience.) Keen to escape the New Jersey Winter, and keen to experience life in a small Belizean village near the border of Guatemala, I boarded a plane to Belize City two weeks ago and only just returned (after an unexpected overnight stay in Houston thanks to the most recent winter storm to hit the North East). I won’t bore you with all the details of my travel, but I will share some photos, observations, and experiences… I hope you enjoy!! Belize is about the size of my home state of NJ (though with less than 5% of the population). I spent most of my time in the west- near the one (legal) border crossing to Guatemala. I was fortunate to have some beautiful days (it’s been a very rainy past few months), and I was able to capture some beautiful views. Stunning scenery overlooking the countryside on one my walks up to Xunantunich. Looking out over Benque Viejo from the hilltop in Succotz. I also headed to Placencia (on the coast) for a few days. 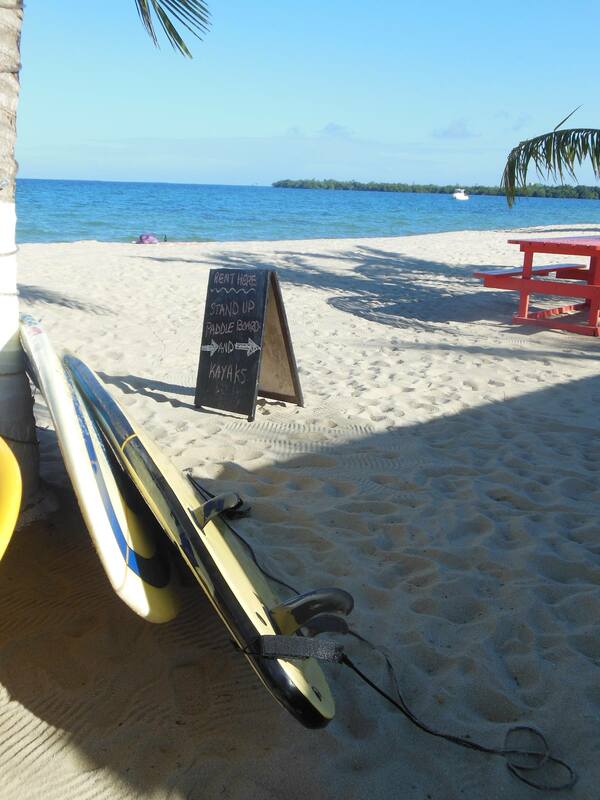 The Caribbean was beautiful, as was the weather, and I enjoyed time in the water as well as some time stand-up paddling. Beautiful water and skies in Placenica. A great place to go for a paddle. I enjoyed paddling in the open waters, and cruising along next to the mangroves, the roots of which were teeming with small fish. 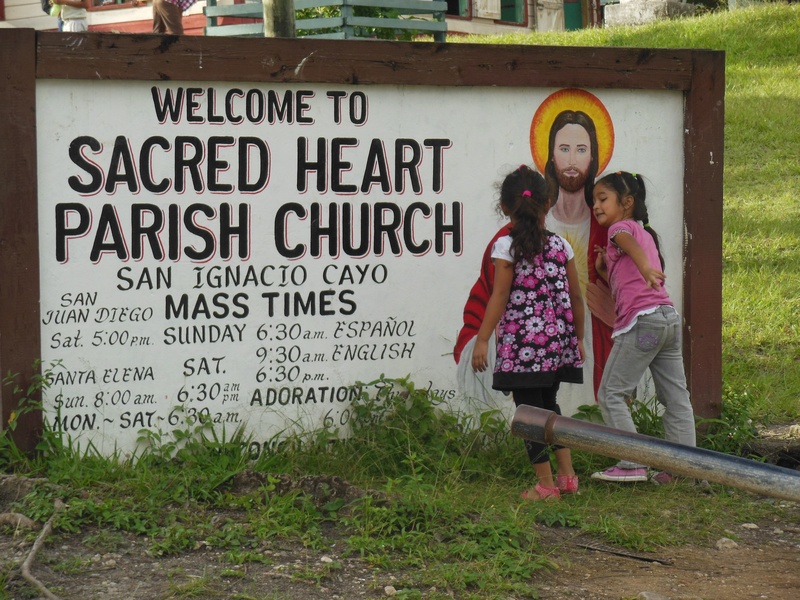 When inland, I spent quite a bit of time in the “twin cities” of San Ignacio and Santa Elena. I was very fortunate to join my friends on a photo shoot of the twin cities for NICH– the National Institute of Culture and History. 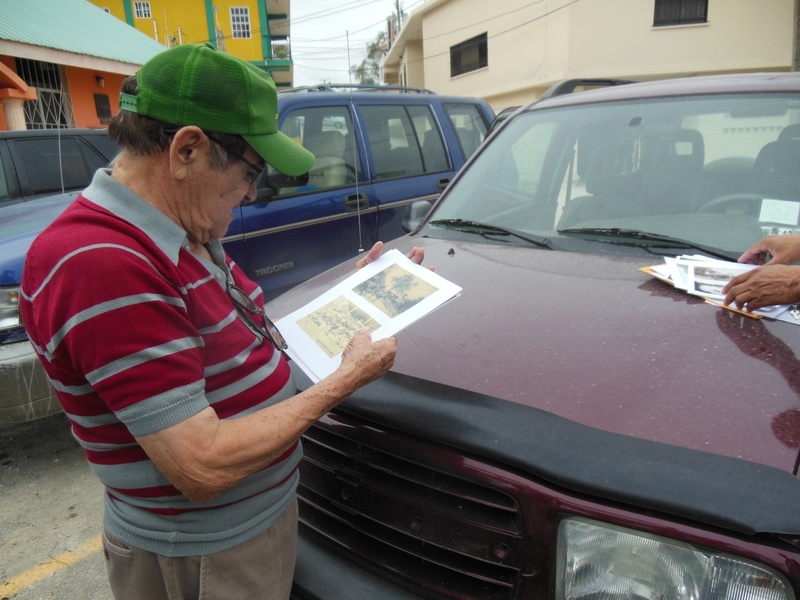 We travelled around the city taking pictures of historic sights and getting an amazing history lesson from Hector Silva- a retired politician with an encyclopedic knowledge of Belize. He is the last living pre-Independence minister (Belize attained independence from the Crown in 1981), and has an impressive political history. He was first elected to local office at the age of 23 in 1957 (or maybe it was ’58- I’ll admit I didn’t take notes while I was talking to him and was surprised to find that this Belizian legend didn’t have a wikipedia page! ), was appointed to the first Belizian cabinet, and has been very involved in Belizian politics up to the present day (though he is retired). He is a fount of knowledge, and obviously well loved by Belizian people. It was impressive to see the immense respect for him from passers by as we walked around the streets of the twin cities. “Don” Hector Silva is incredibly passionate about Belize, and about life. Even in his 80s he had more excitement and enthusiasm for life than many people a quarter of his age. I was incredibly fortunate to not only meet him him, but also to get a tour of the twin cities from him. NICH has collected a number of historic pictures of the twin cities, which Hector Silva took us through. At one point he showed us a picture of the reservoir and said how he had travelled to London to petition for money for its construction. Prior to its construction people got all their water from the river that separates the twin cities- the Mopan River. One of our stops on our photo tour of the twin cities was the market place, where Don Hector identified a number of new fruits for me. 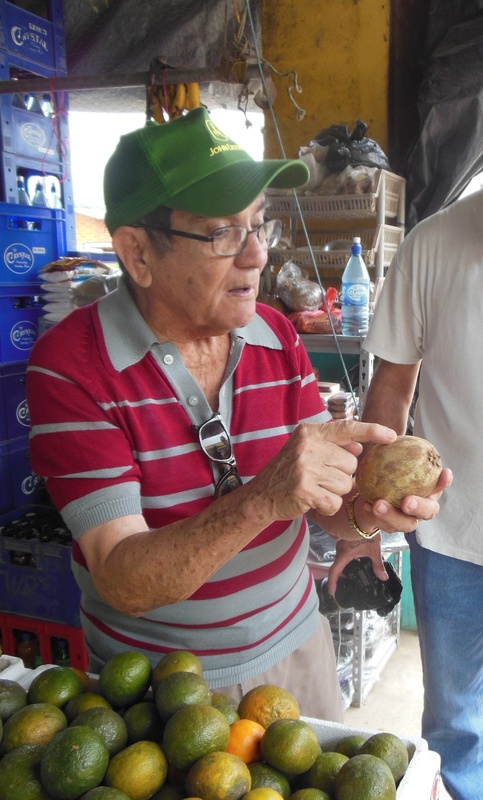 Here he is singing the praises of the Sapodilla- the fruit from the tree that produces chicle (the traditional starting ingredient for gum). Belize used to export large amounts of chicle when it was still used in chewing gum. Don Hector likes to joke that Belize is actually a part-owner of Wrigley Field in Chicago. 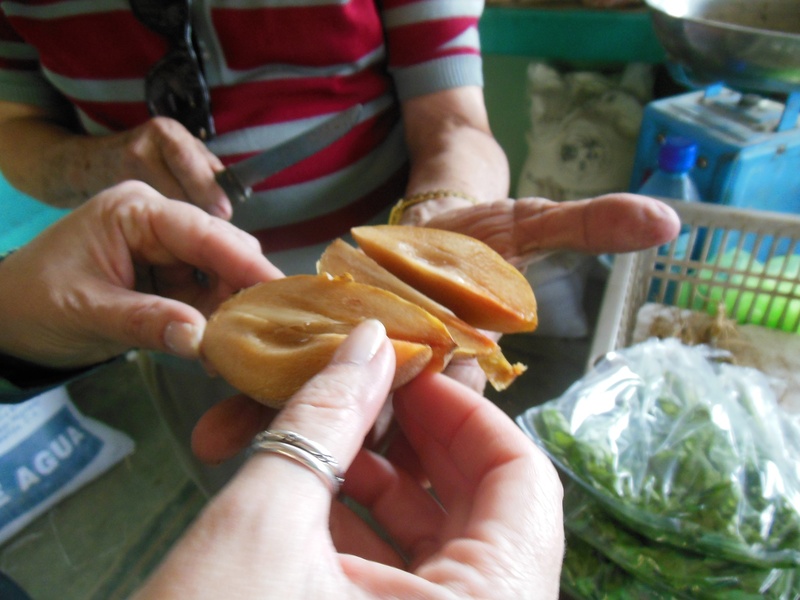 Hector insisted we try a Sapodilla, and it really was delicious (I had another 3 during my stay). It is very sweet, with a texture much like a very ripe pear. 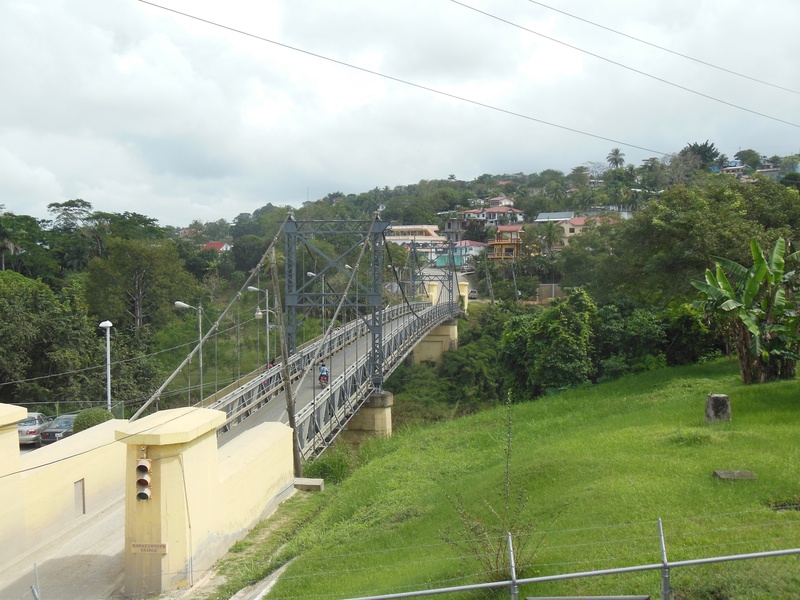 This is the Hawkesworth bridge, or “High Bridge”, that you cross to go from San Ignacio to Santa Elena. On the return trip you take the “low” bridge. In my pic you just see the one small motorcycle crossing the bridge, but I watched 18-wheelers make the crossing as well! 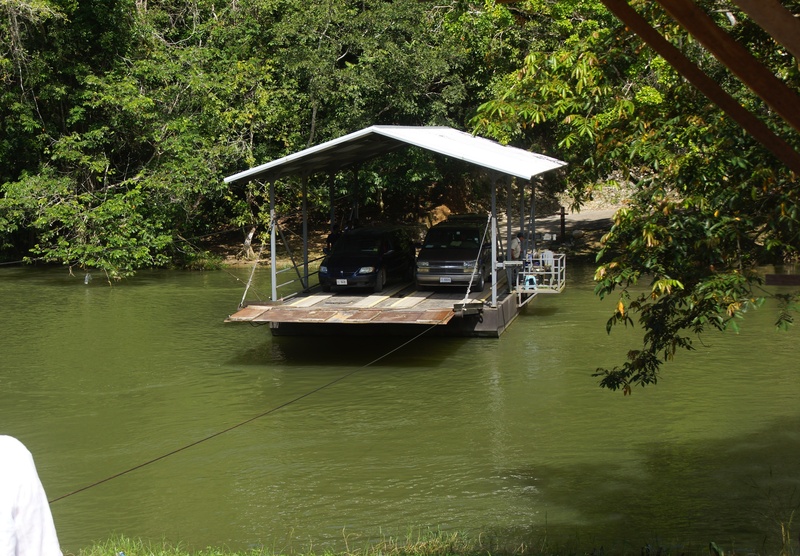 Prior to the construction of bridges and roads connecting the twin cities to Belize city there was a fair amount of river traffic for transportation of goods. As an enthusiast of local and traditional foods, I’m a fan of exploring markets when I travel (I wrote about markets in Sharjah when I visited the Middle East last year). 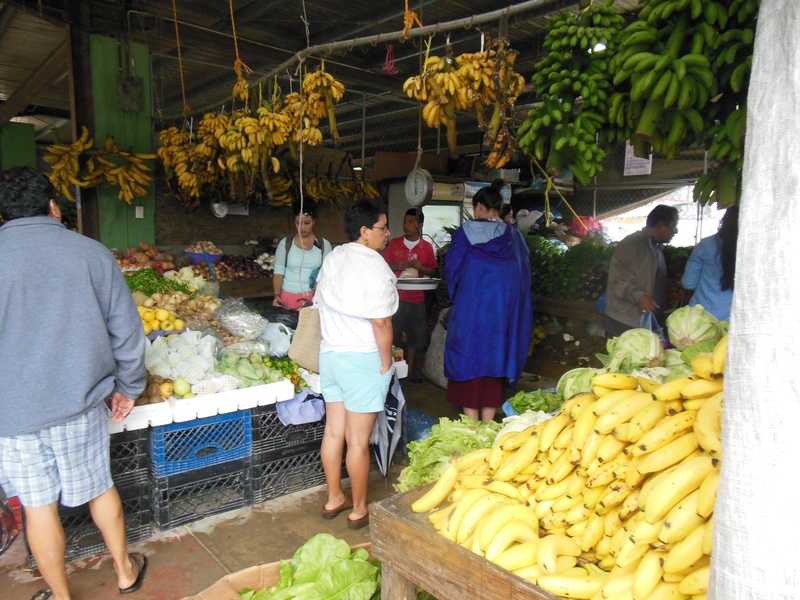 The markets in Belize are full of fantastic fresh fruit and veg. 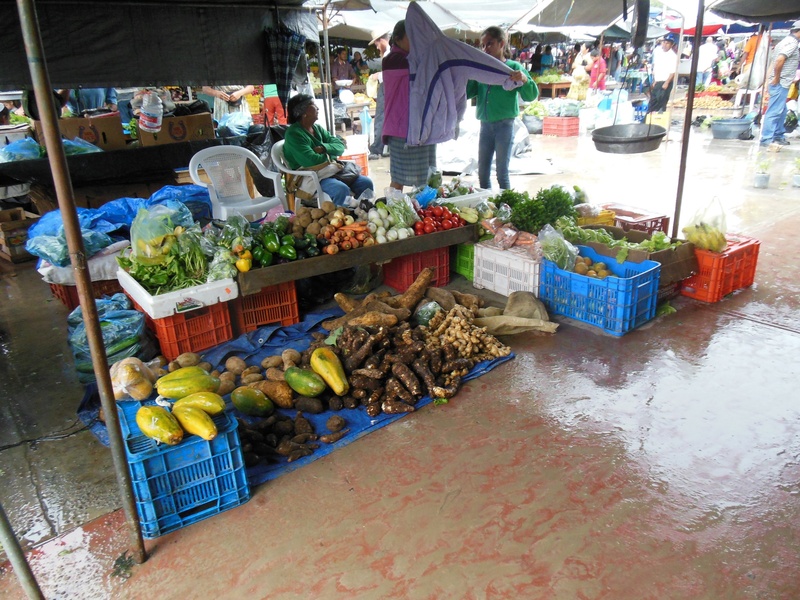 I first visited the San Ignacio market on Thursday with NICH, when there were a number of fruit stalls open. On Saturday, Market Day, the market is chock-o-block with stalls selling produce, clothes, herbal remedies, jewelry, and just about anything you can imagine. 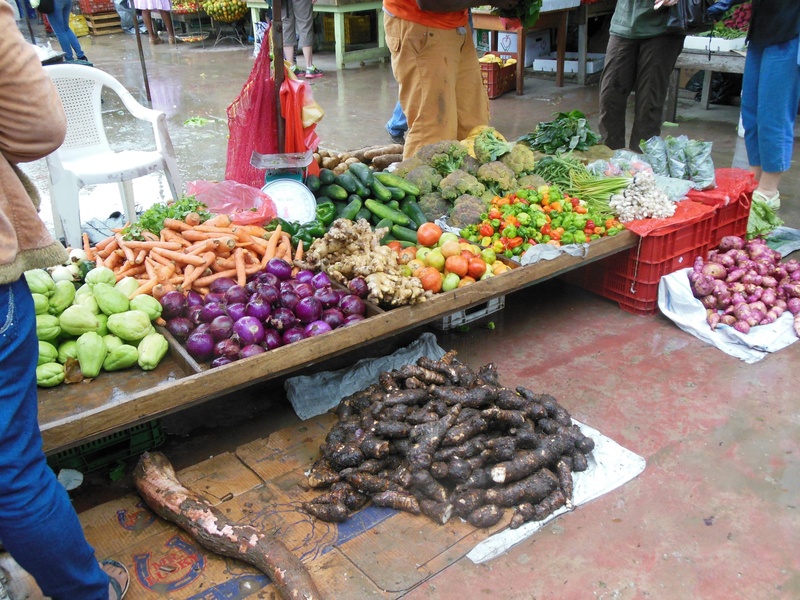 A traditional produce stall at the market. And yet MORE produce… Interestingly, there is a large Mennonite community in Belize, where they are very involved in agricultural pursuits. 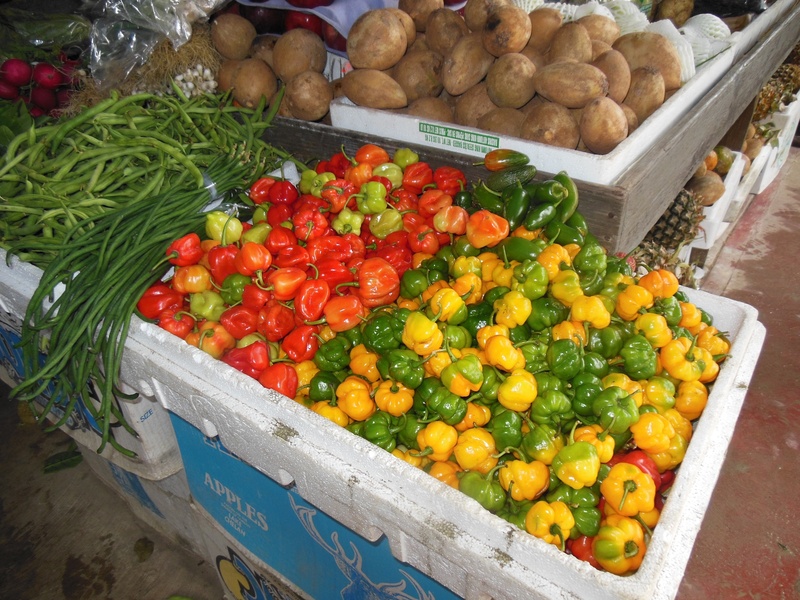 No table in Belize is complete without at least 1 bottle of hot sauce, and hot peppers are a staple of the diet (Habaneros in particular). The love of spice in this part of the world definitely makes me want to learn more about Darwinian gastronomy. 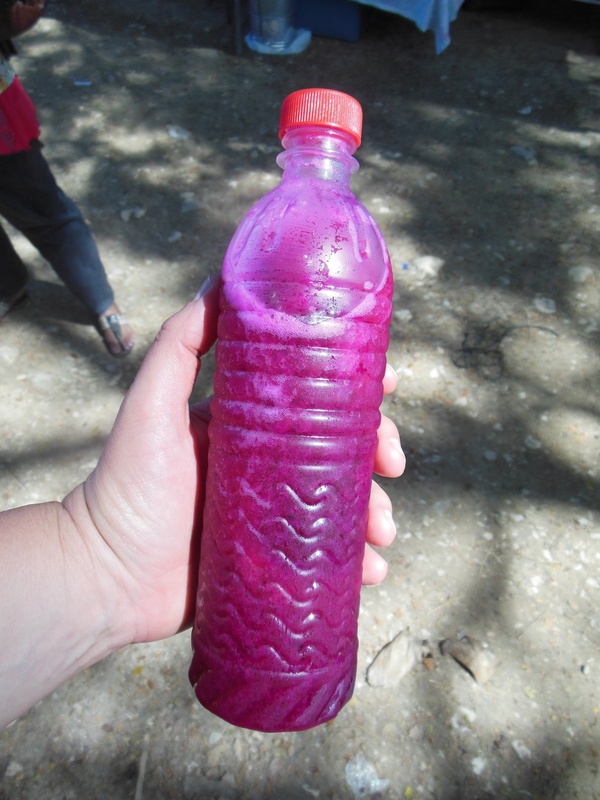 Pitaya Juice- Pitaya (AKA Dragon Fruit) Juice, purchased in the San Ignacio market. It was delicious! My haul- I finally got to try “Apple Bananas”, which I wrote about a year ago, as well as culantro- a herb that tastes like cilantro but looks very different (it is in the bottom left). 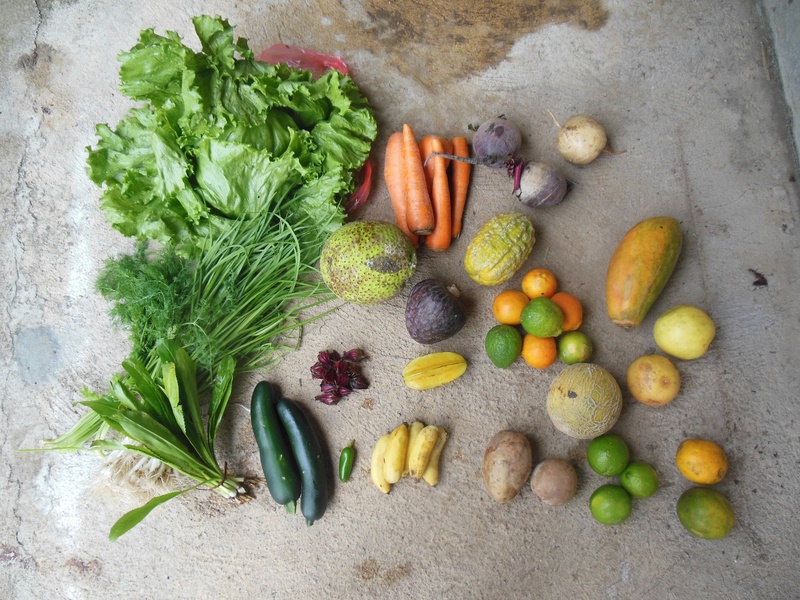 Also featured: lettuce, scallions, dill, zucchini, jalapenos, sorrel, star fruit, custard apple, bread fruit, sapodillas, melon, papaya, jicama, beets, carrots, and a pile of citrus! 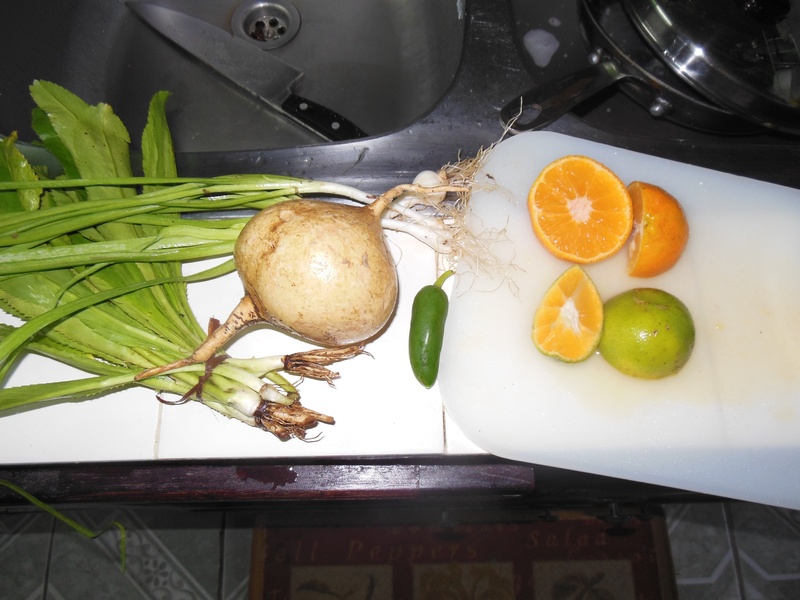 (the pile of green and orange fruits are actually Jamaican limes, while the green fruit in the bottom right corner is a ripe orange!). The beauty of staying with friends is that I had access to their kitchen, so I was able to try out some new dishes with my purchases. Fried breadfruit (we parboiled the breadfruit then pan fried the slices in coconut oil). I combined jicama with scallions, culantro, jalapeno, and lime juice (yes- that orange thing is a lime) to make a really tasty jicama salad. I’ve only had papaya a few times before, and I generally find them to be very “hit or miss”. This one was certainly a “hit” with me, and I devoured it with a few good squeezes of Jamaican lime juice. One of the cool things I did on vacation was help my friend make coconut milk. 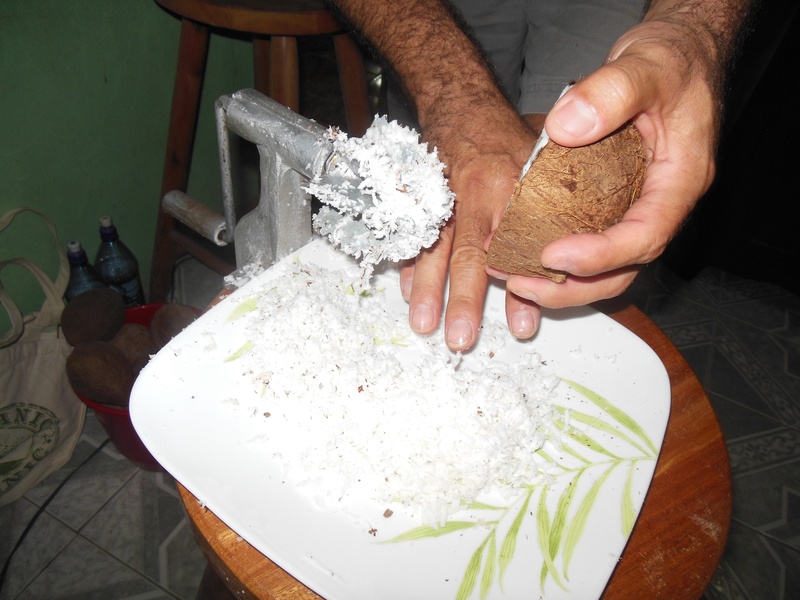 With the help of a machete, a scary looking coconut grinder, some brute force, and a food processor, you too can make coconut milk! 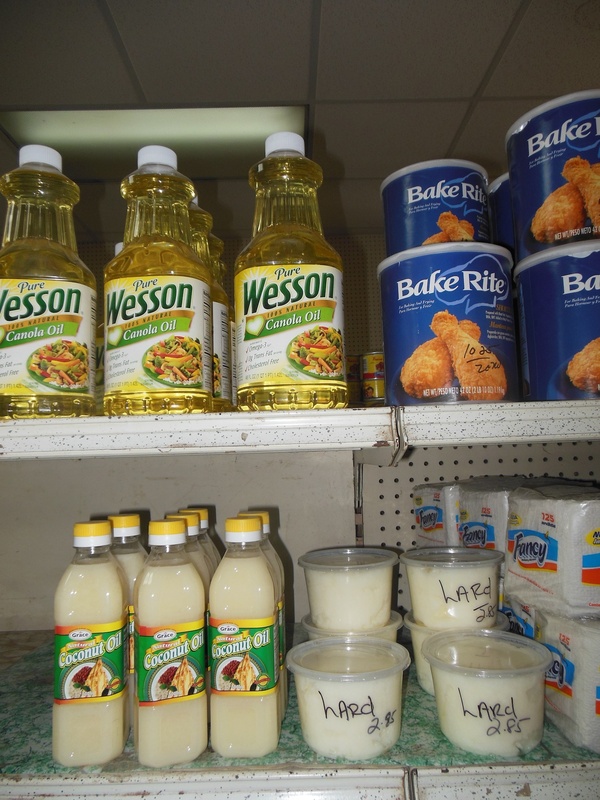 Speaking of coconut… I of course had to check out the selection of cooking fats in a local store. Lard and coconut oil are both produced locally, but are sadly being pushed out by shortening (made from all kinds of things, including animal fats, palm oil, and hydrogenated vegetable oils) and vegetable oils. 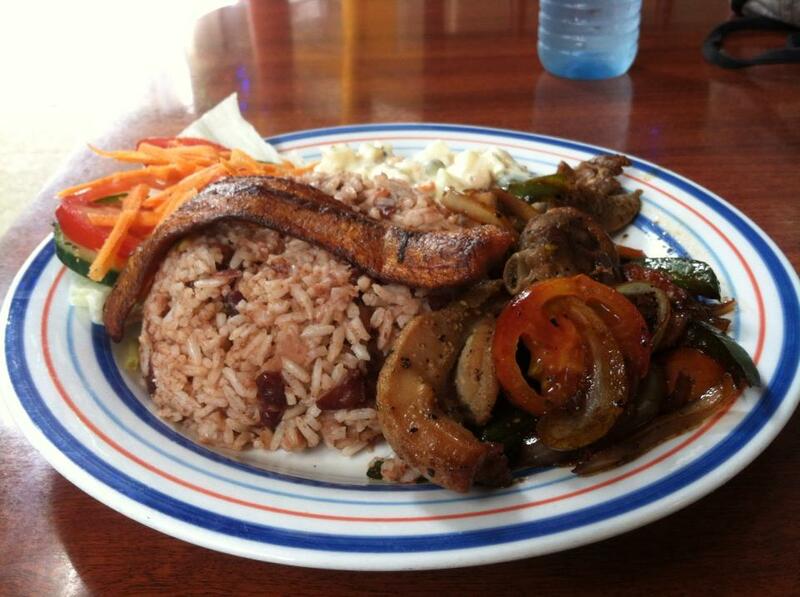 Food in restaurants in Belize was generally very good and VERY cheap. 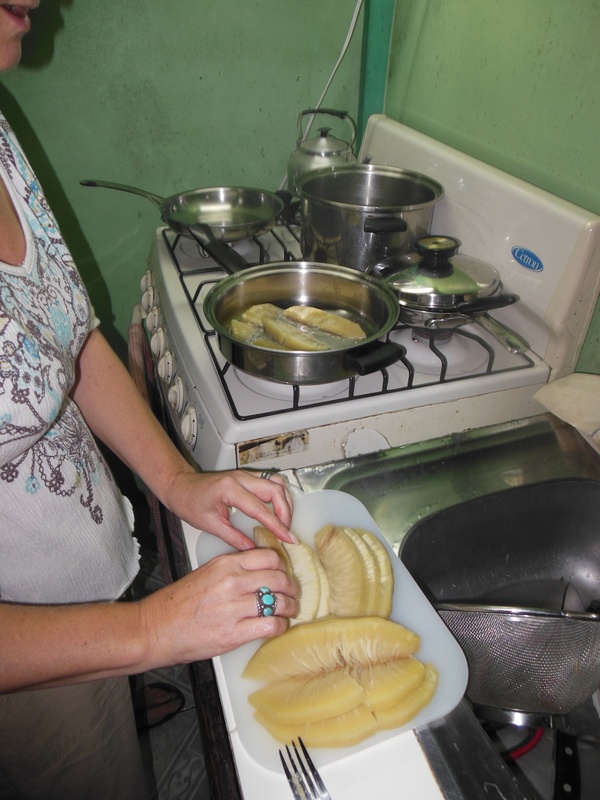 Rice and beans are a popular dish, and while I don’t usually eat them at home, I did partake in Belize. The rice is frequently cooked with coconut. 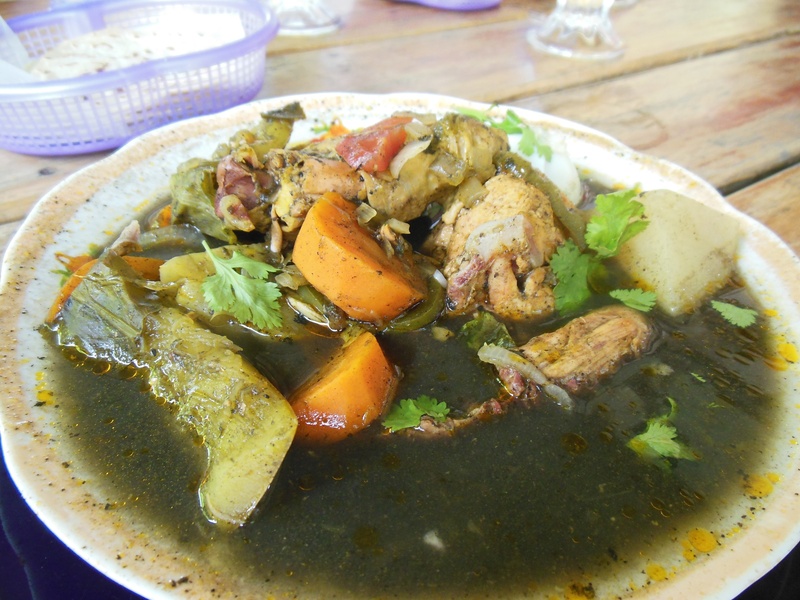 Chimole- a traditional Belizian dish. It is made black by a spice paste that includes charred chilis. This is stewed Gibnut, an animal also known as “the Royal Rat” (because this is what was served to Queen Elizabeth when she visited Belize- incidentally, she hasn’t returned since). It was very tasty (and quite fatty). Meats (chicken, beef, or pork) are frequently served stewed with rice and beans (and as with this dish, some plantain). After partaking in quite a bit of street food (the tacos, at 3 for $1bz in the market are a bargain), returning to the US and seeing the plastic wrapped apples in the airport lounge was rather amusing. 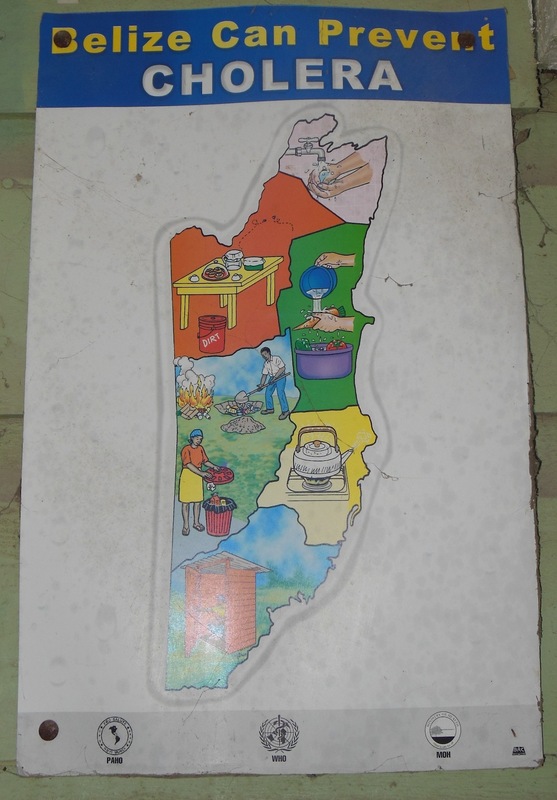 There are very few regulations in Belize, and people often cook food in their home and then walk around the streets selling it- I saw this with everything from BBQ chicken dinners to coconut candy. I have a lot more to share, but this seems like a good place to sign off for now… Thank you Damon and Bonnie for being wonderful hosts!! I will try and get more up tomorrow!